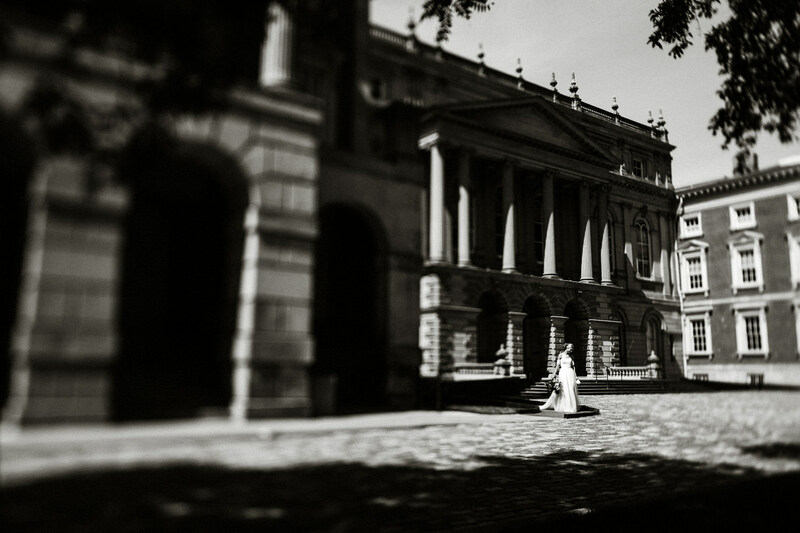 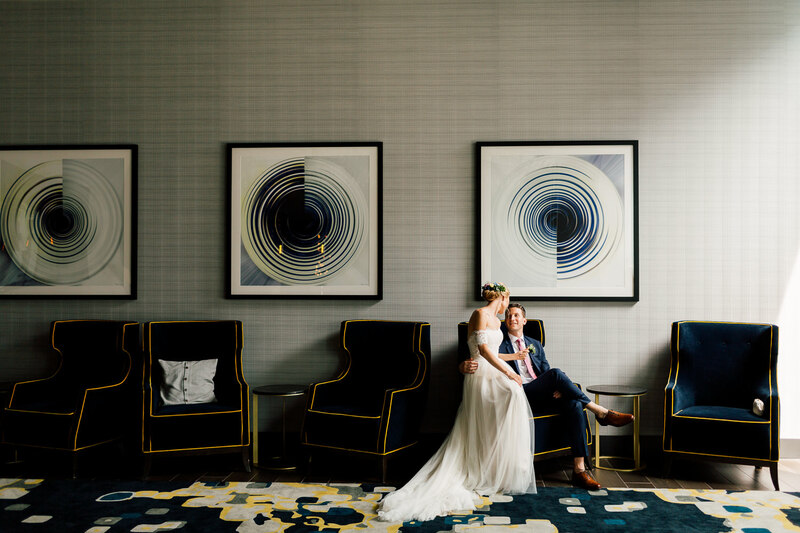 Sandra and Ryan’s wedding steered away from traditional expectations, making it all the more unique. 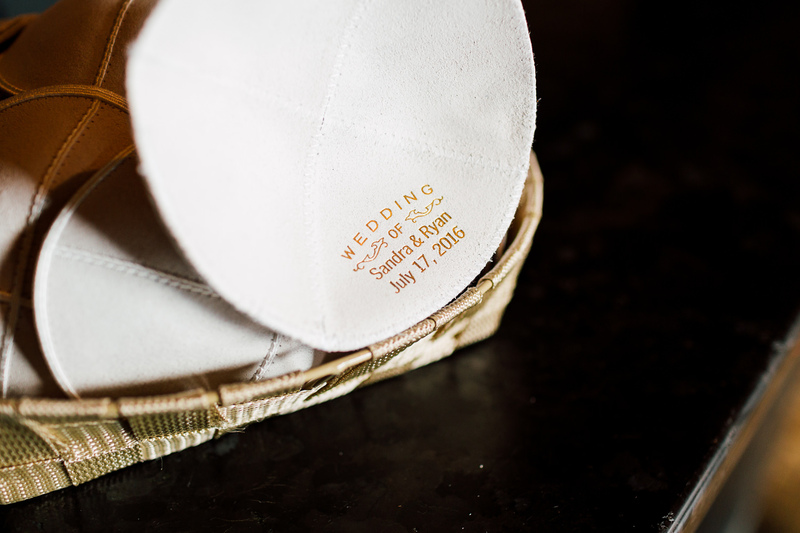 We knew right from the beginning that the day would be filled with details that will get us snapping away. 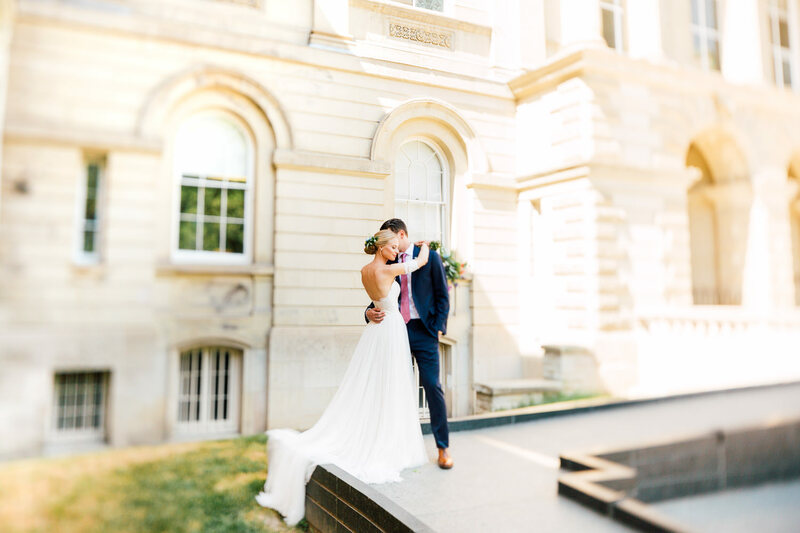 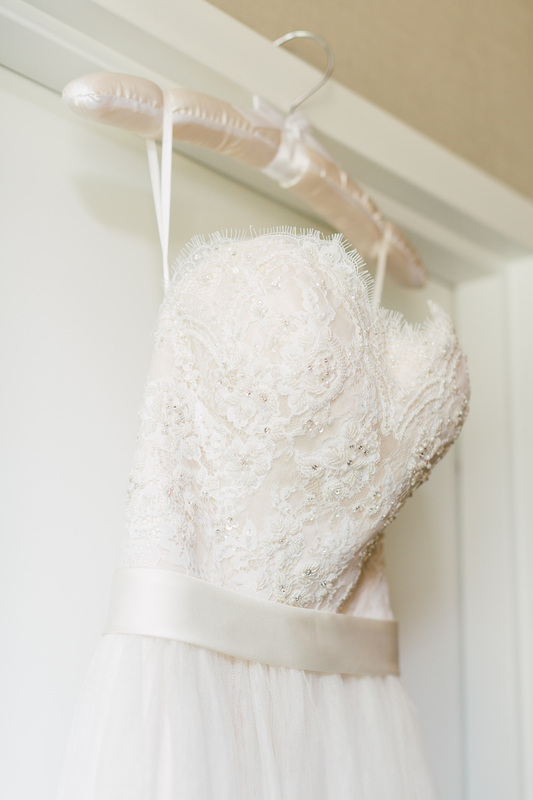 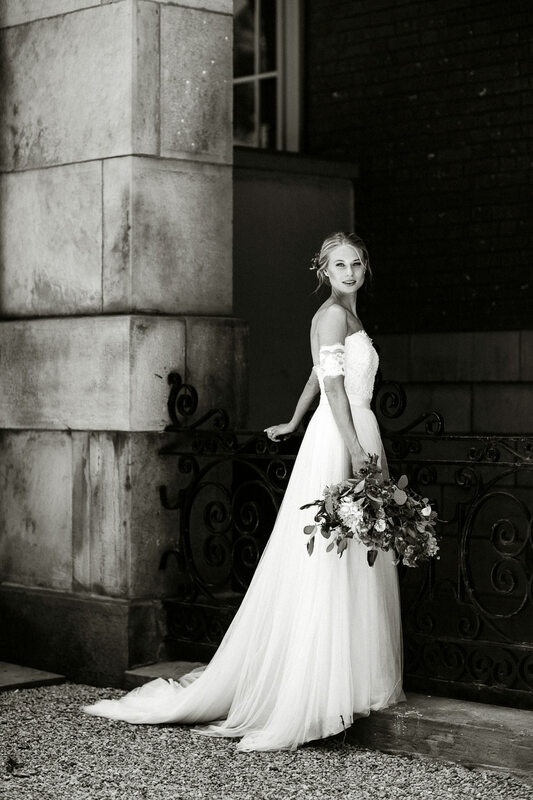 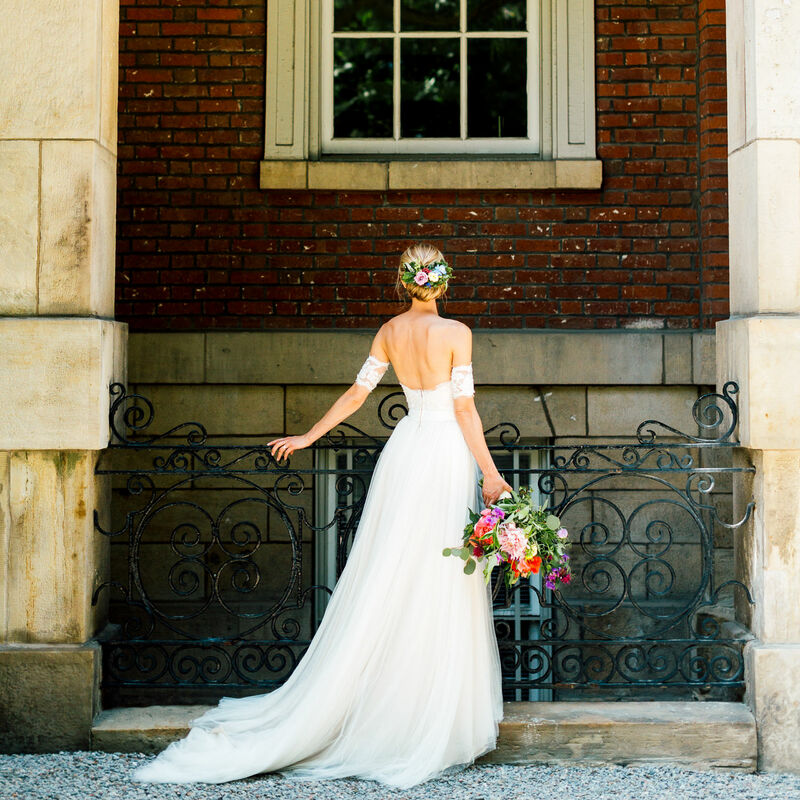 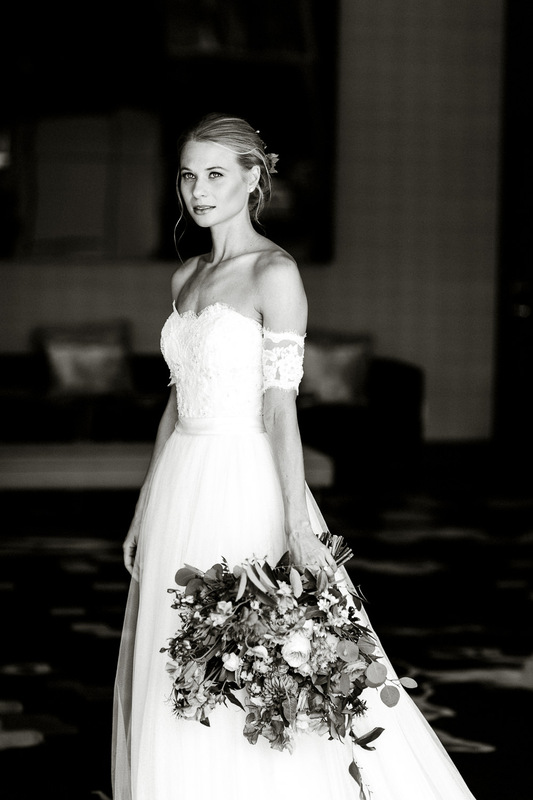 When Sandra first slipped into her a-line gown, we already thought she looked effortlessly beautiful. 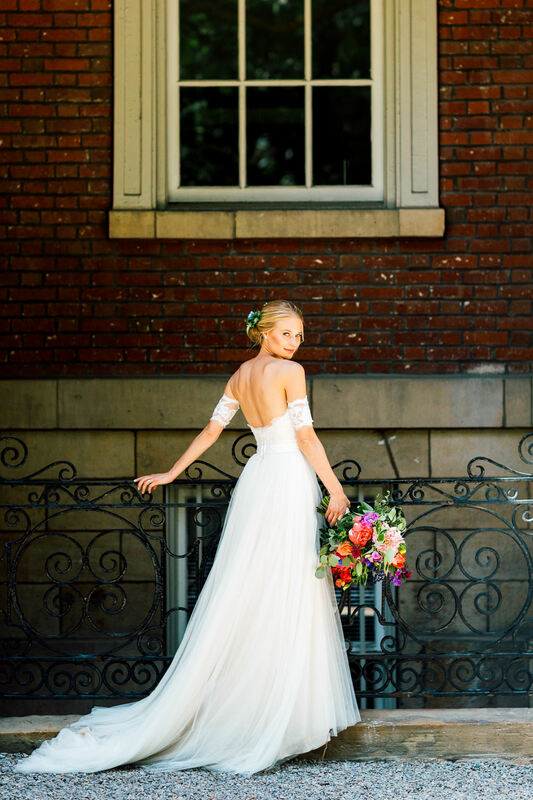 To our surprise, she slipped on sleeves on her upper arms, creating an edgy off-shoulder effect. 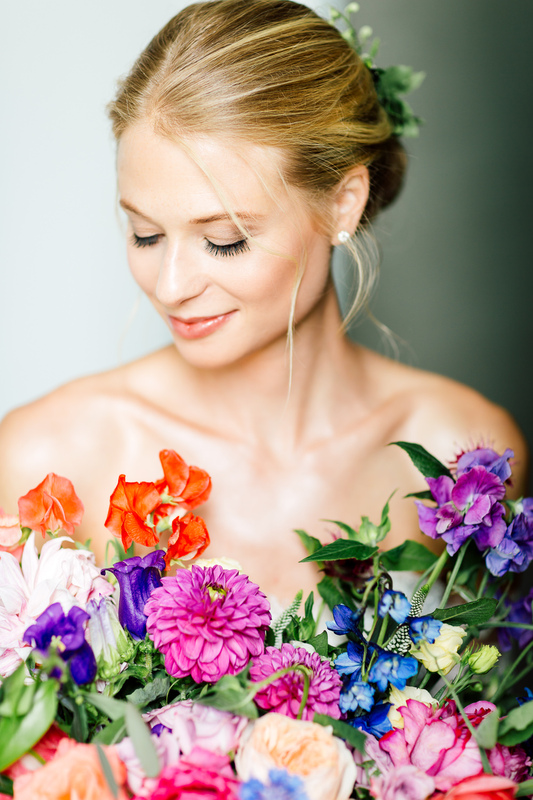 Her hair was worn in a delicate up-do decorated with a band of flowers, completing her boho chic look. 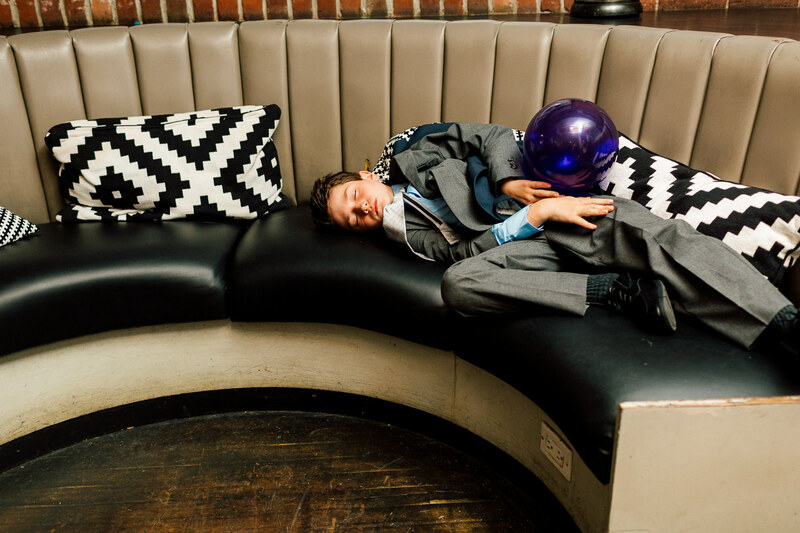 Ryan, on the other hand, looked dapper in his blue suit matched with a light pink tie, and brown leather lace up shoes. 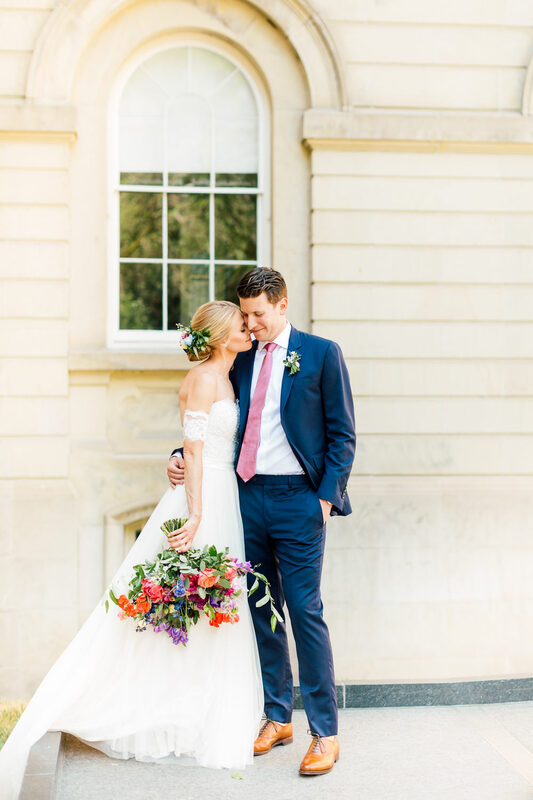 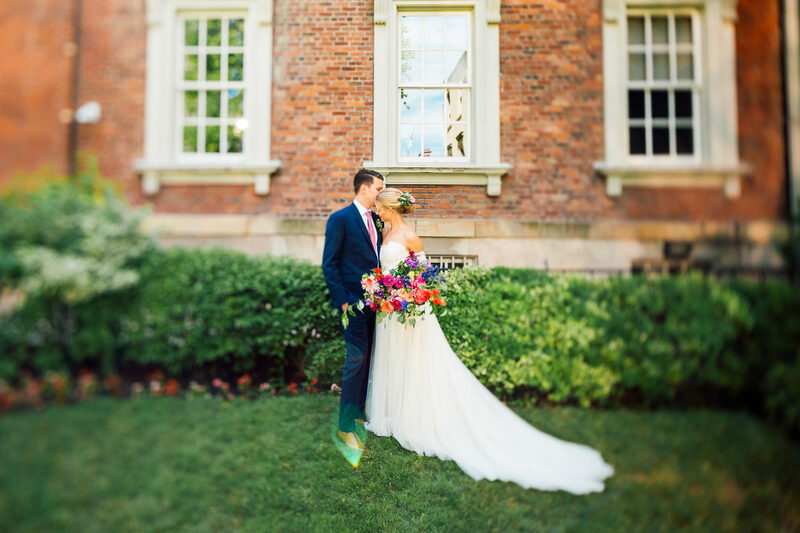 Together, the couple appeared vibrant and stylish. 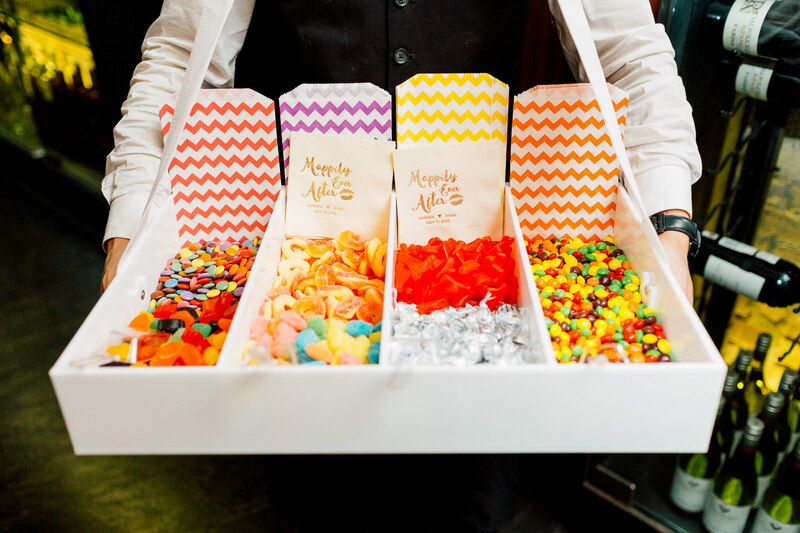 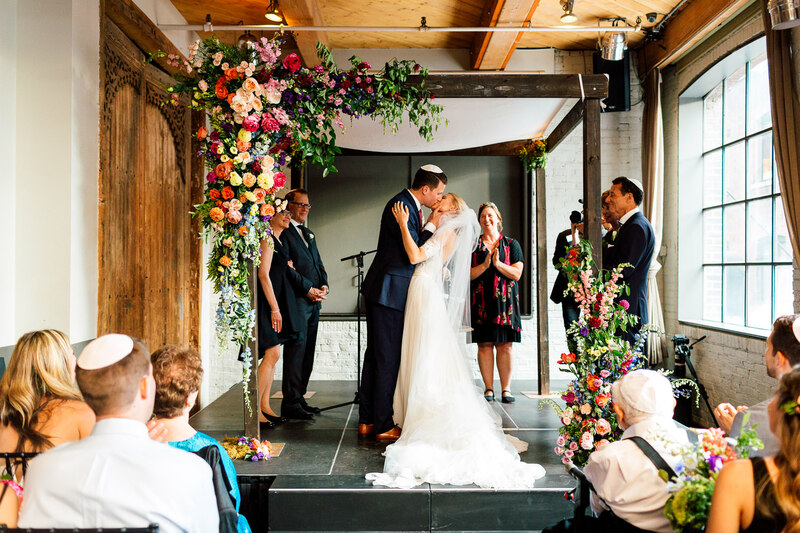 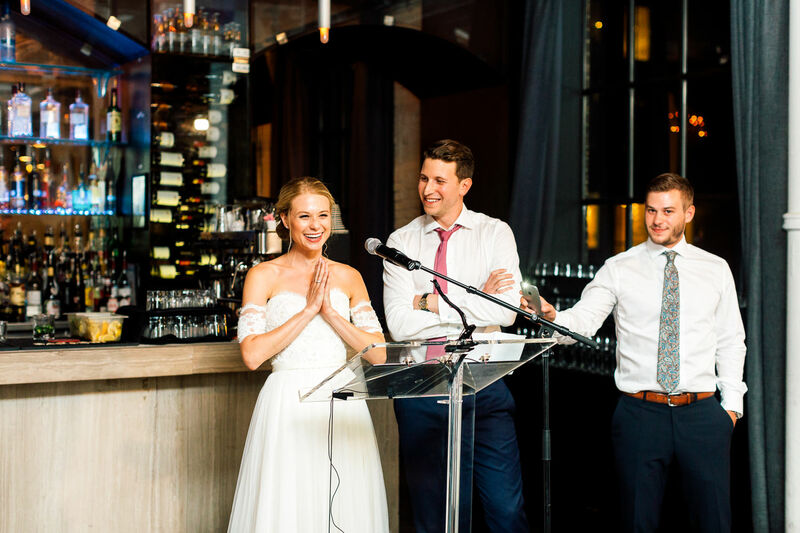 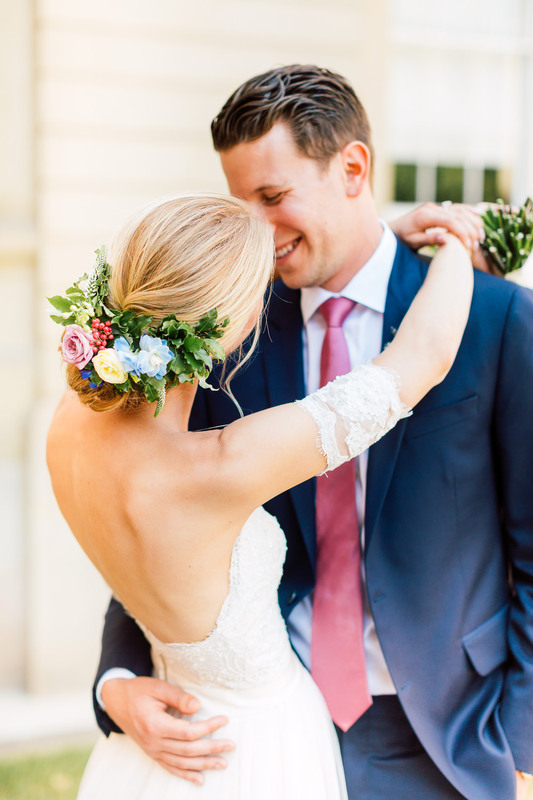 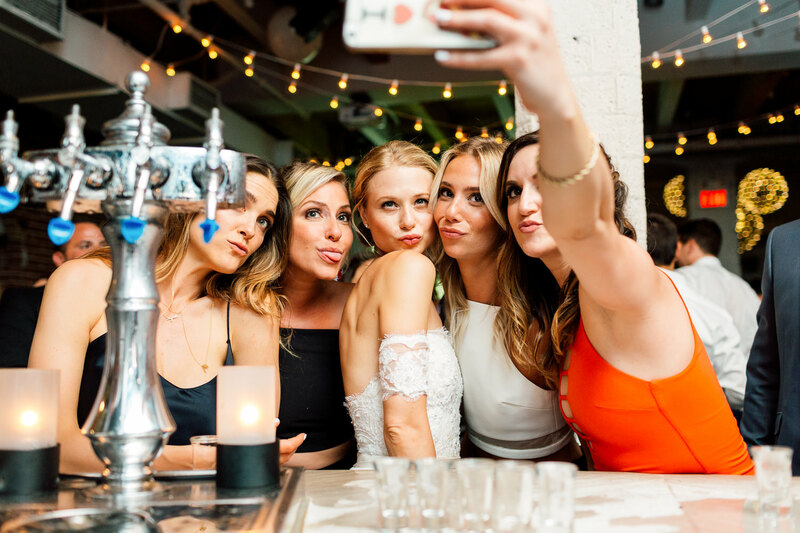 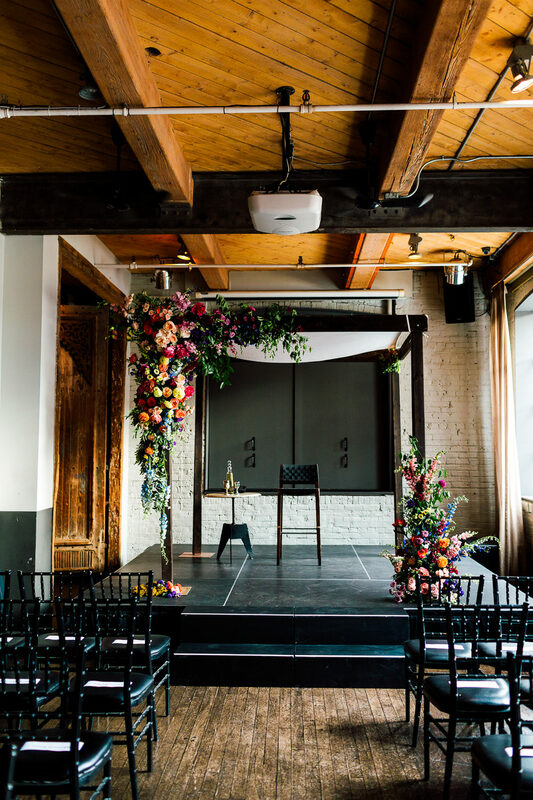 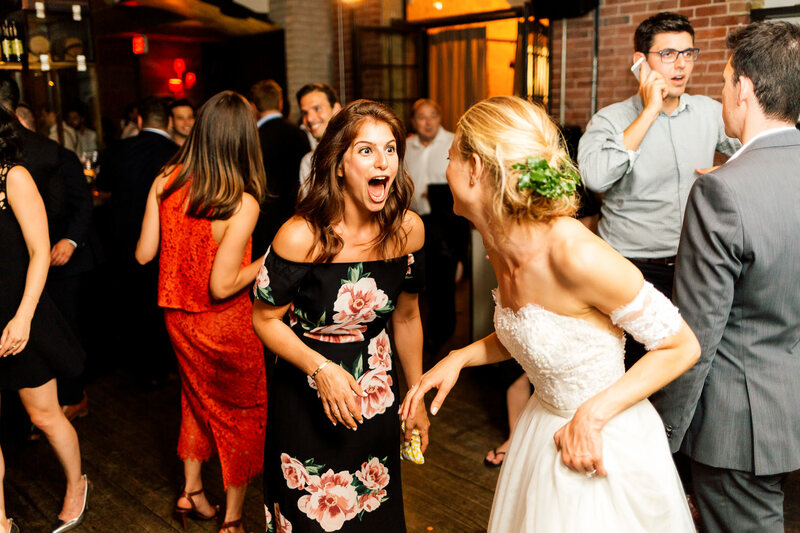 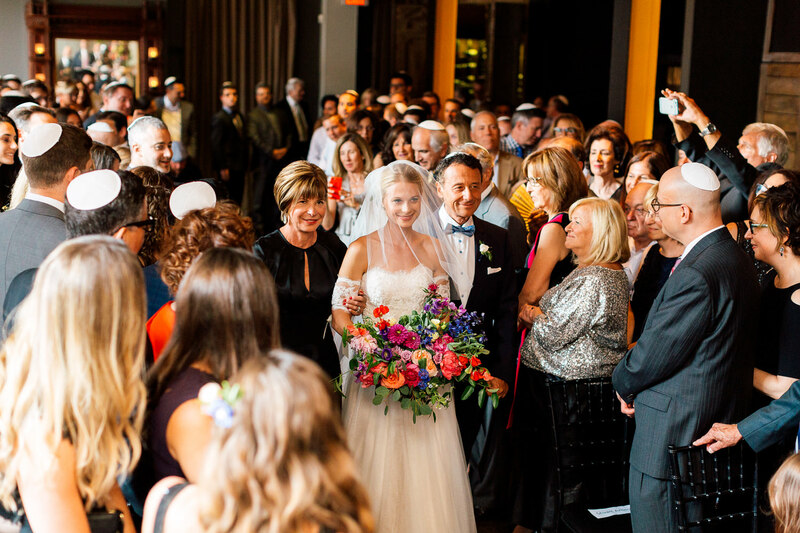 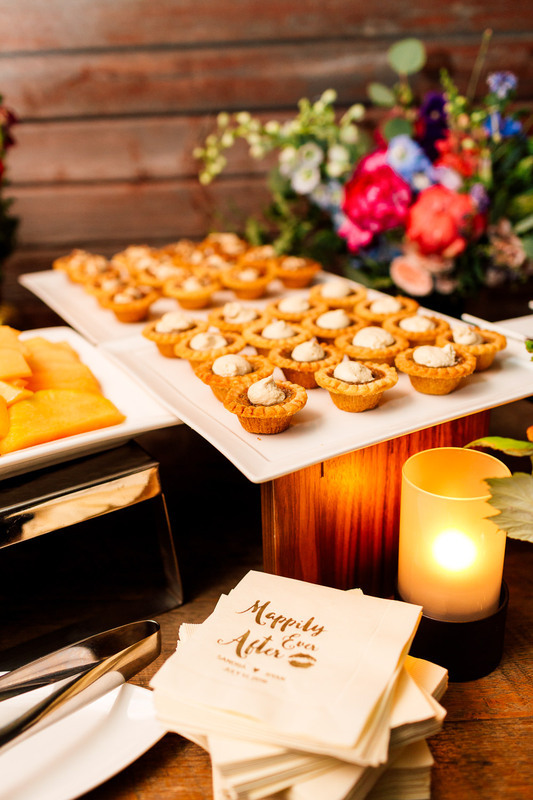 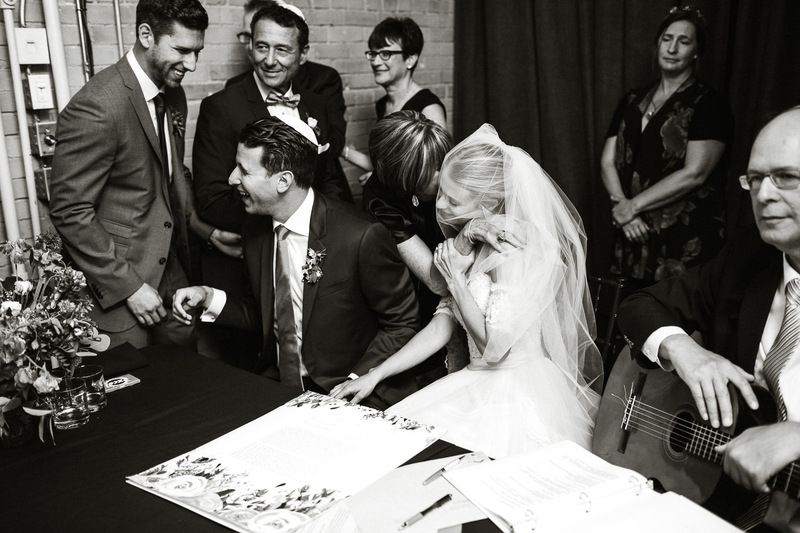 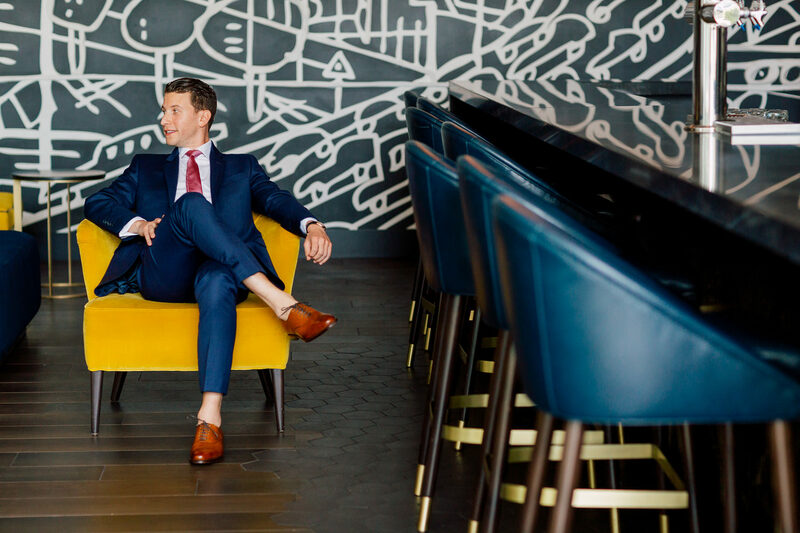 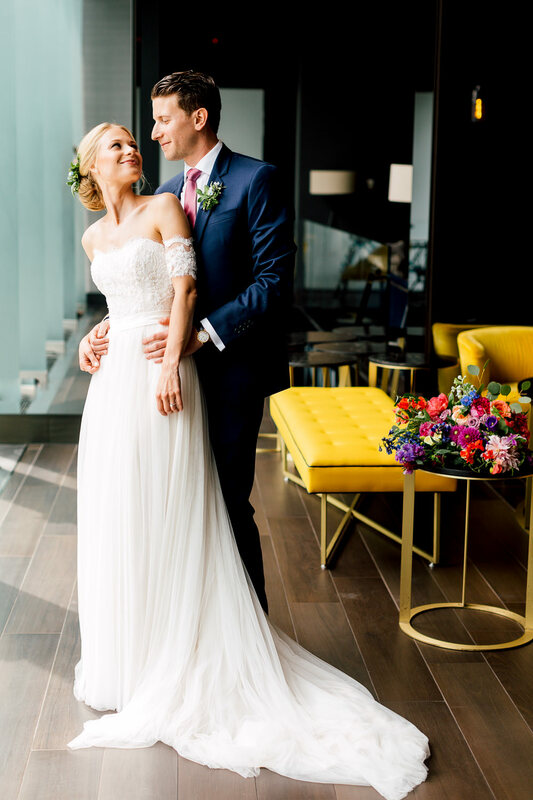 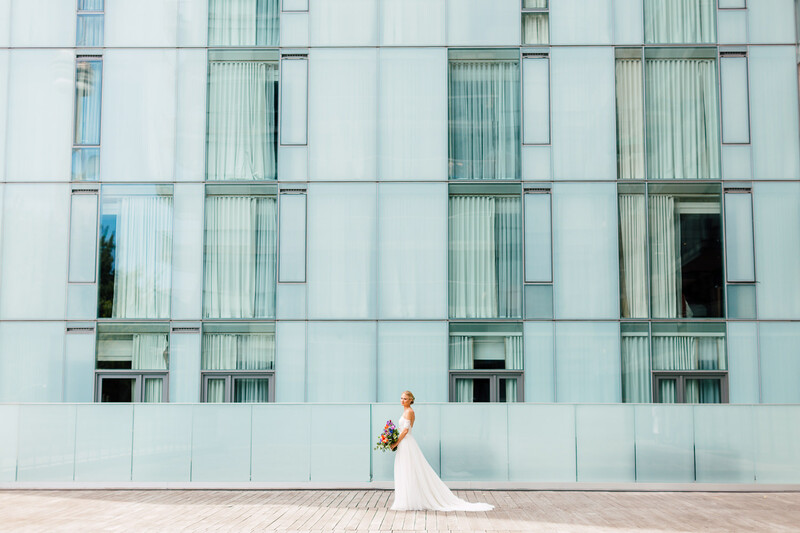 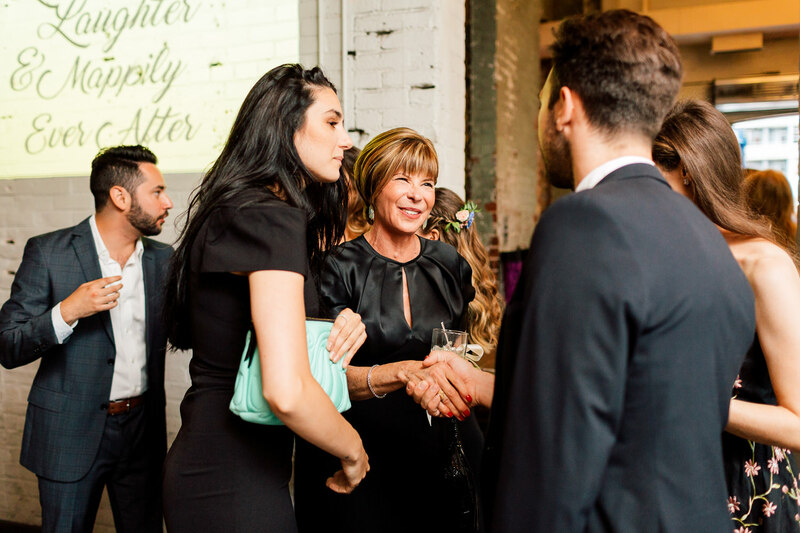 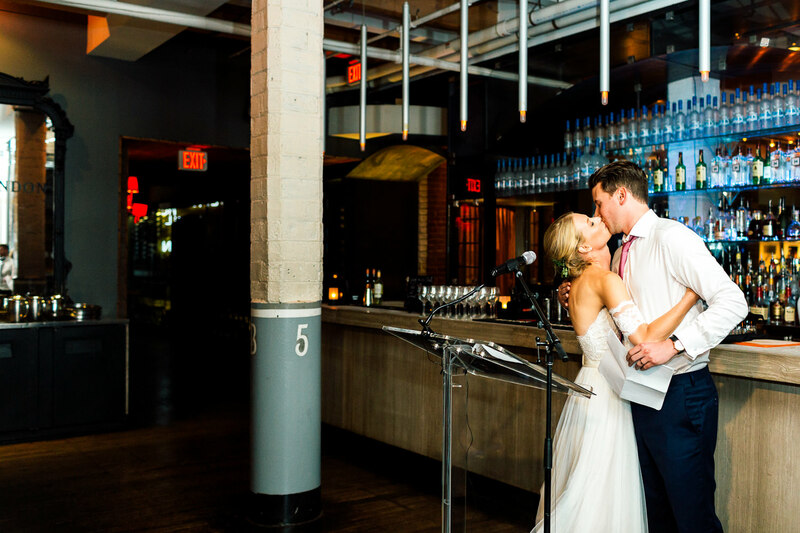 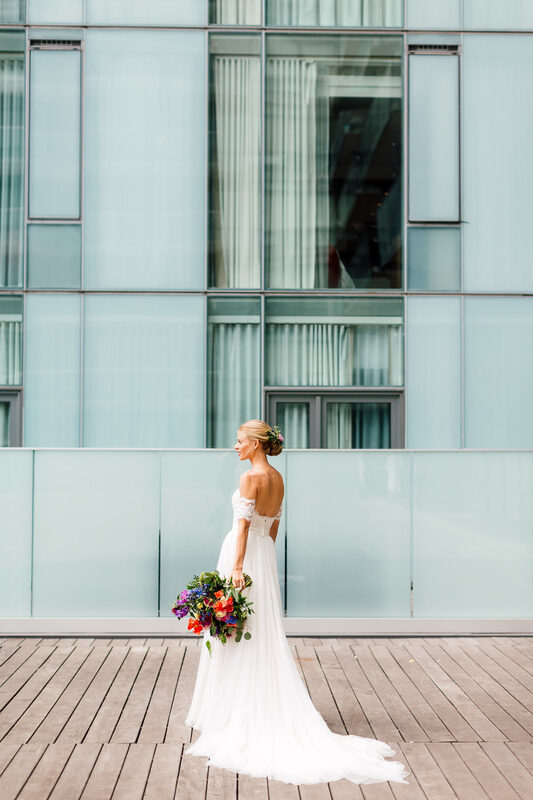 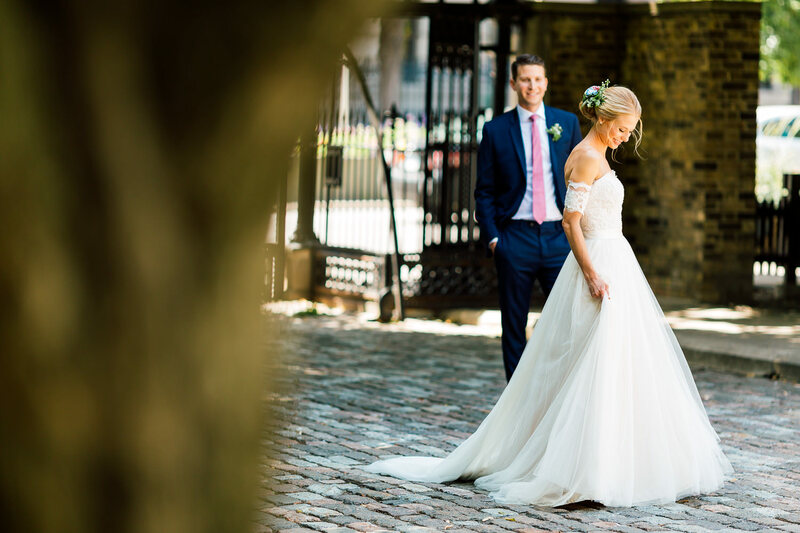 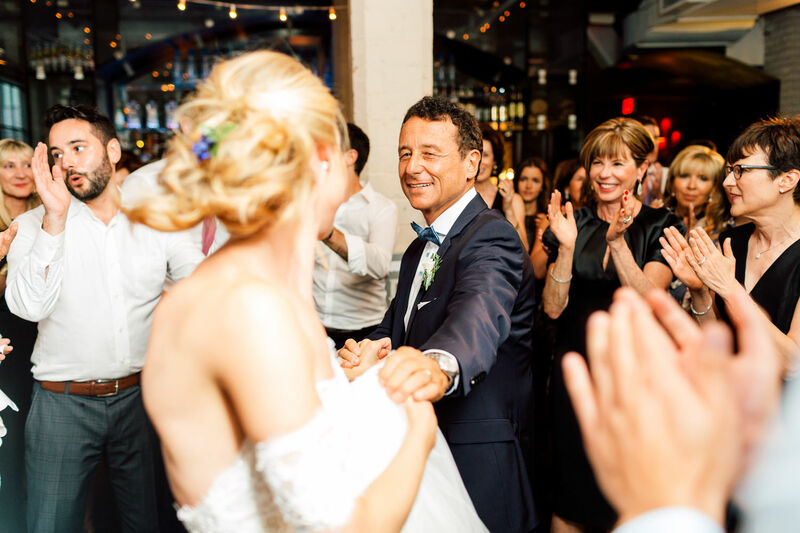 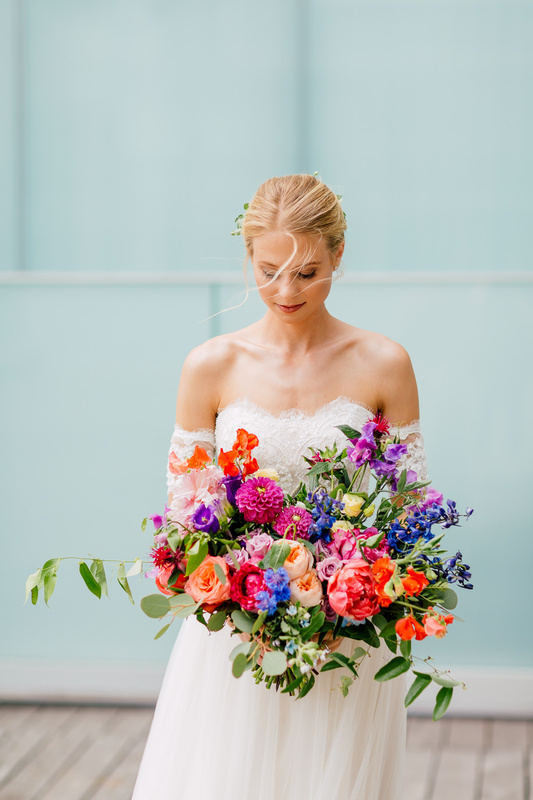 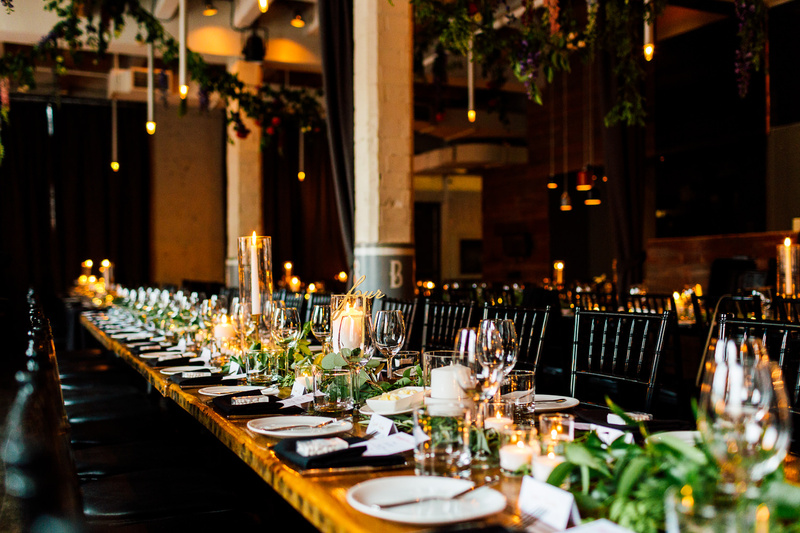 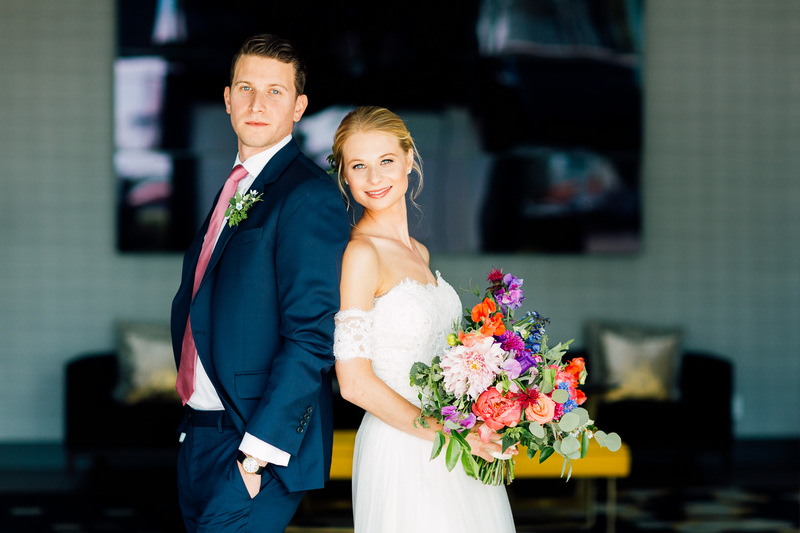 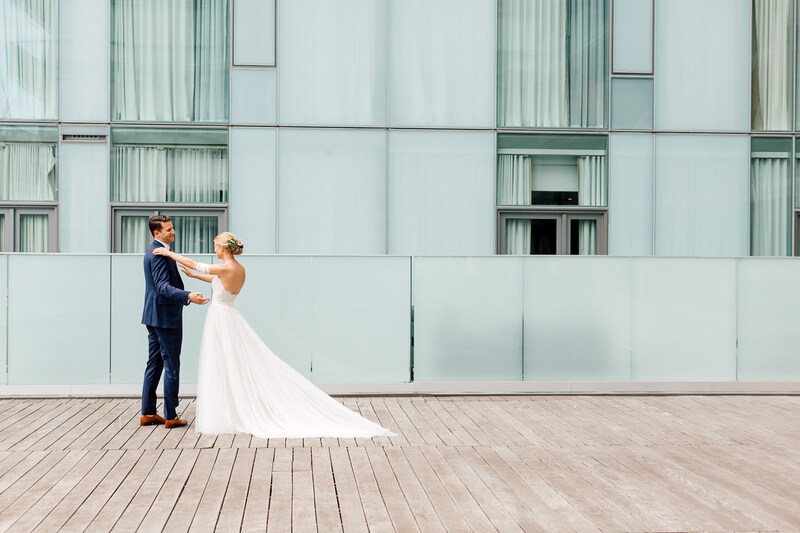 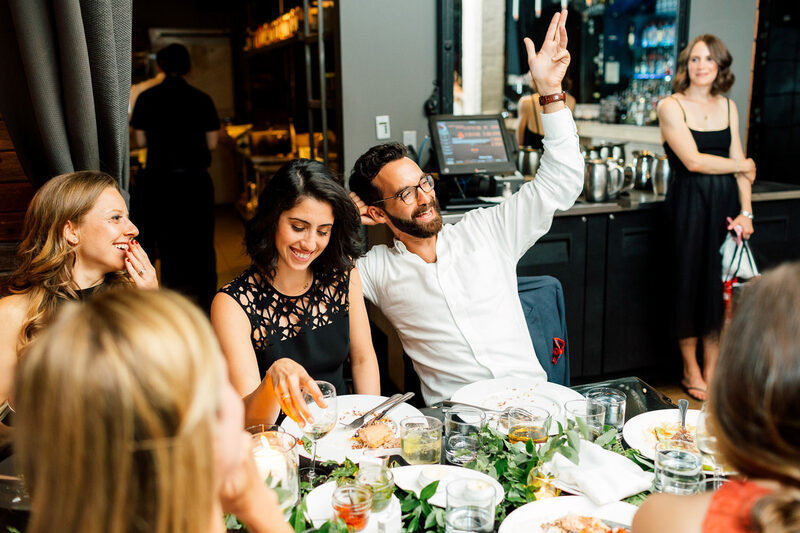 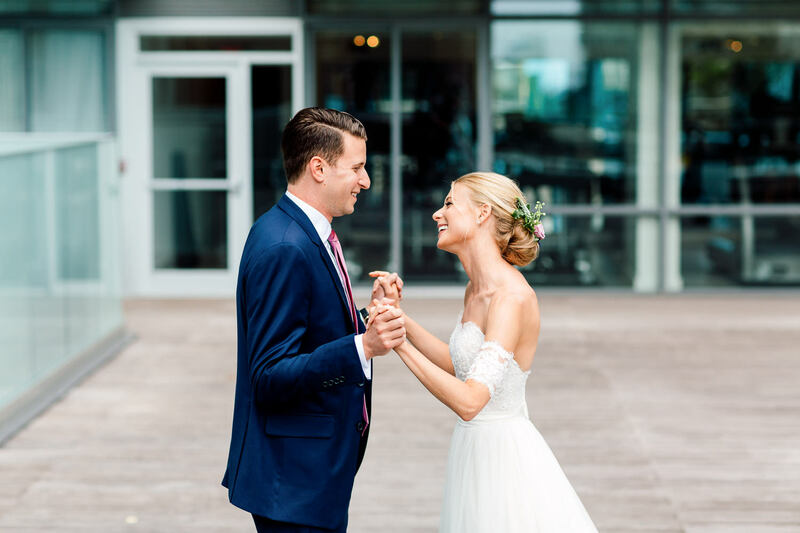 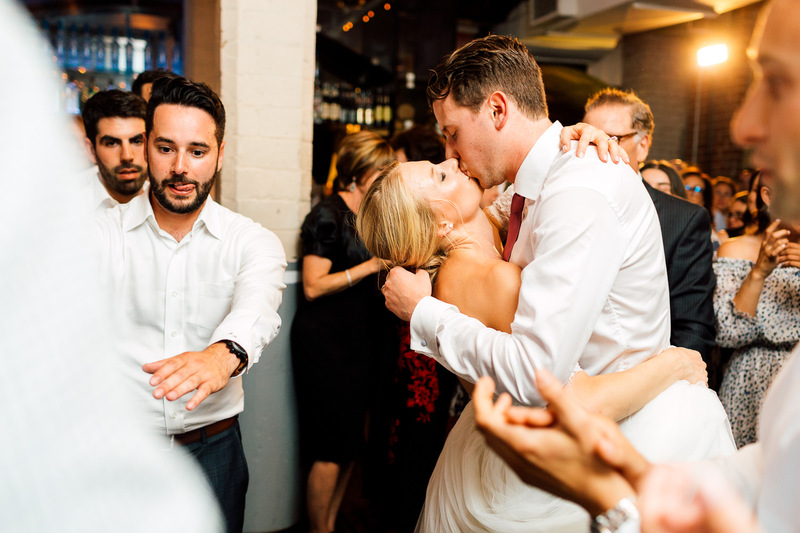 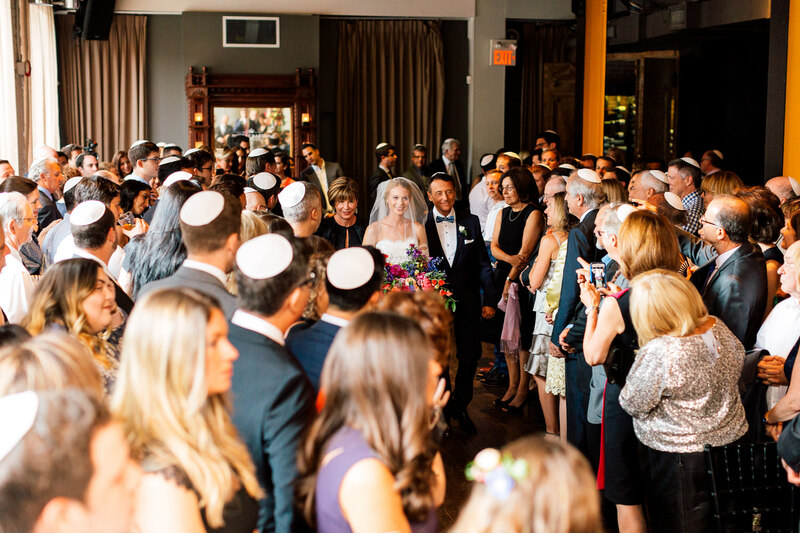 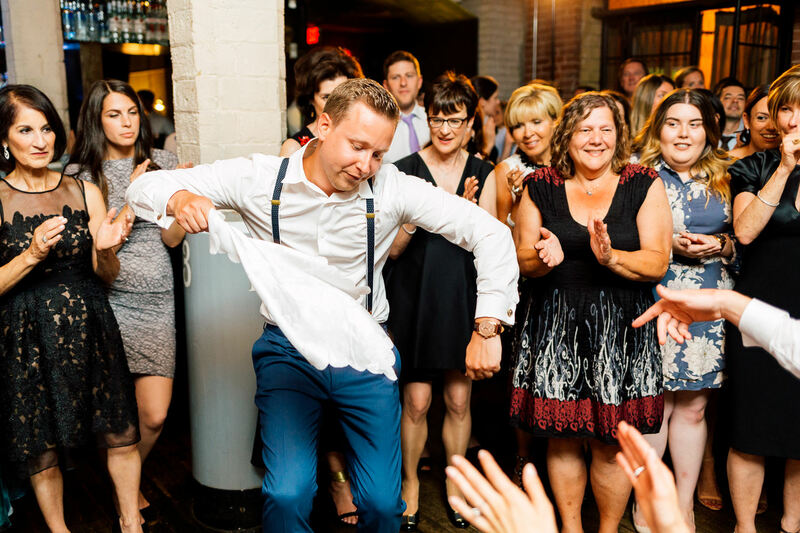 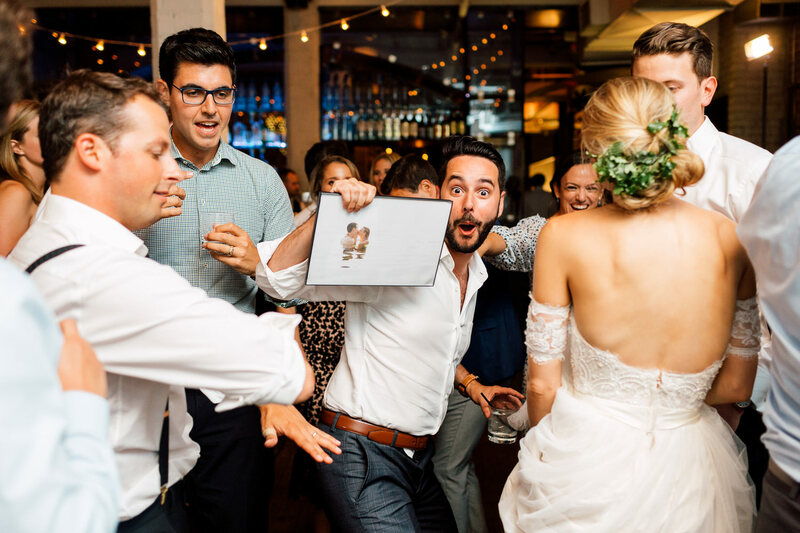 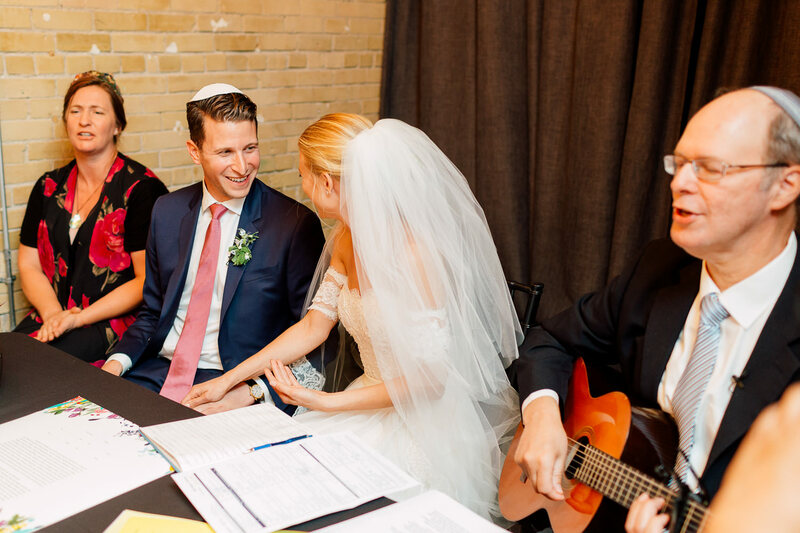 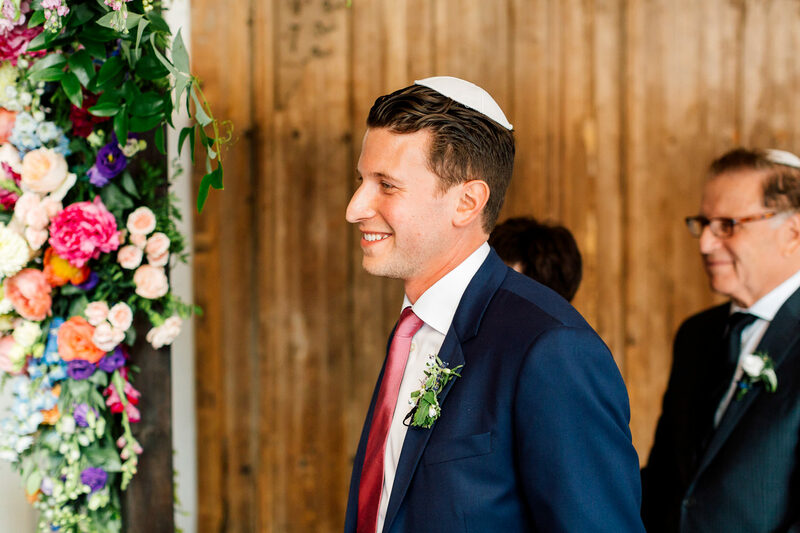 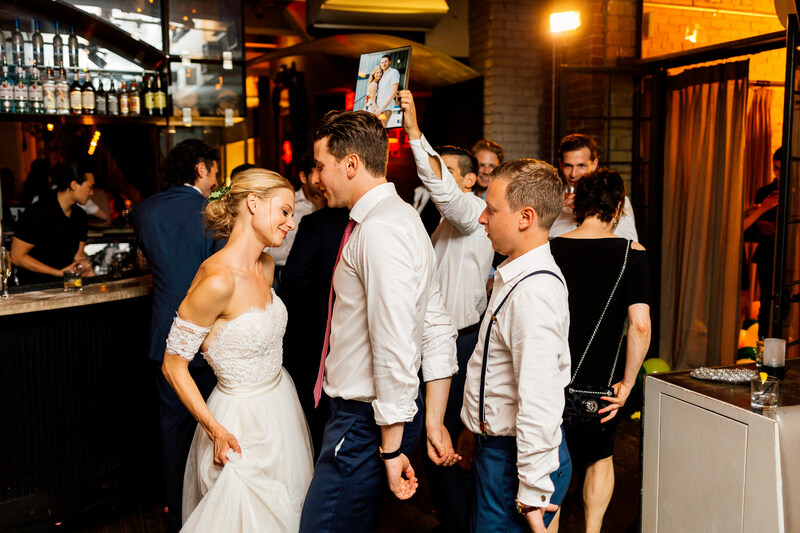 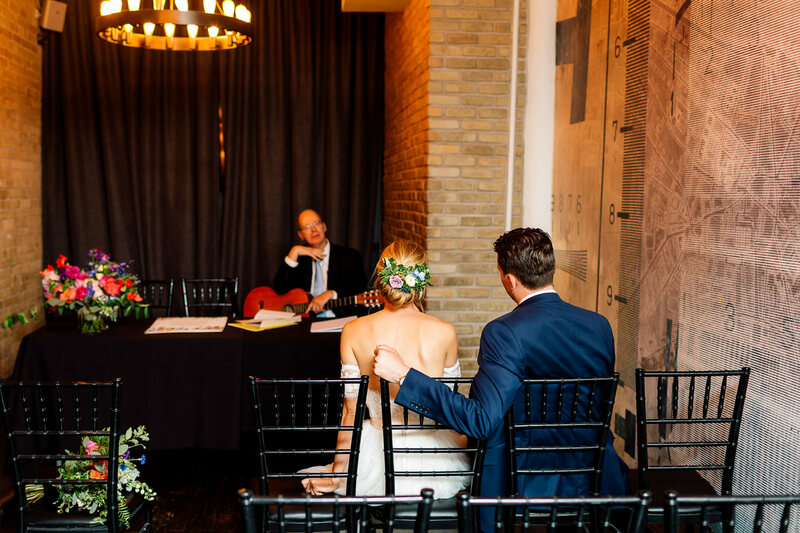 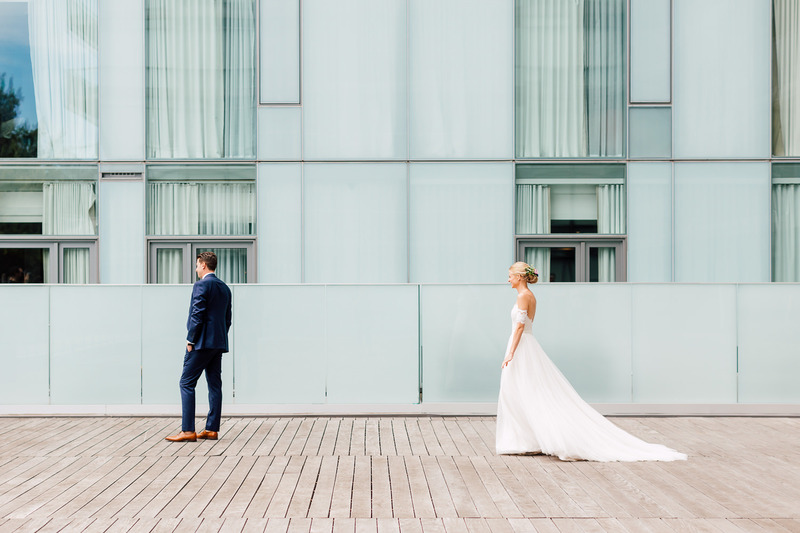 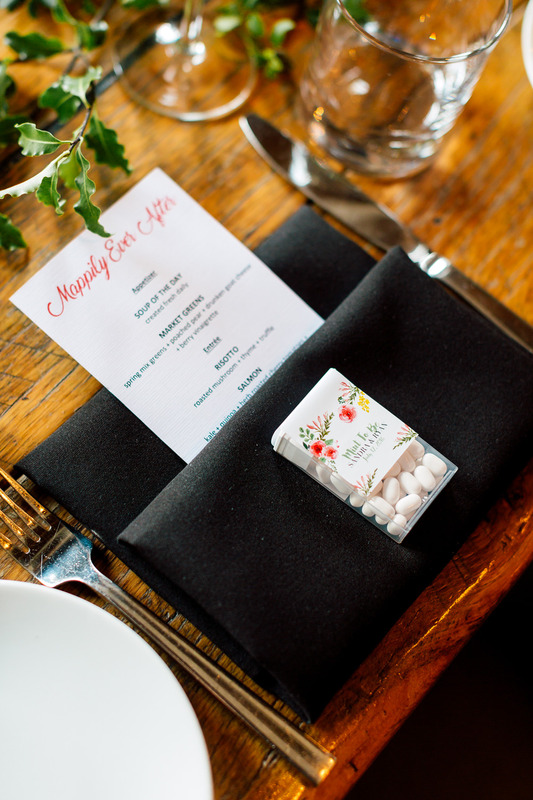 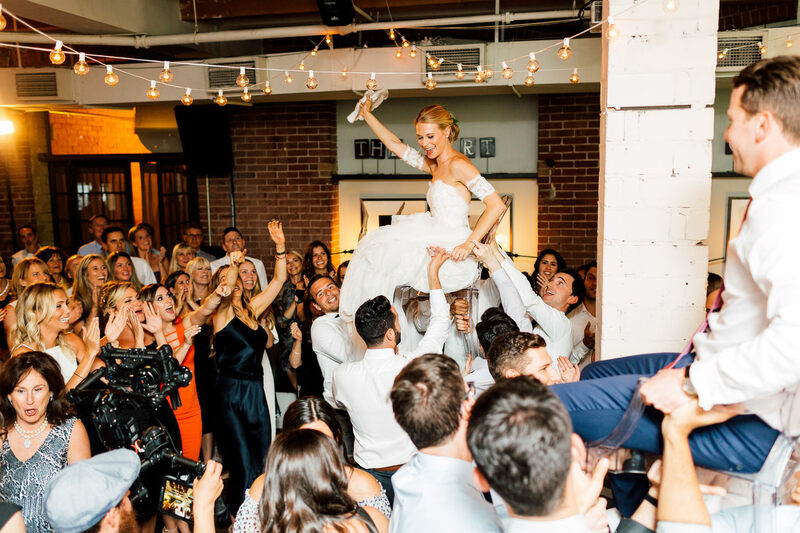 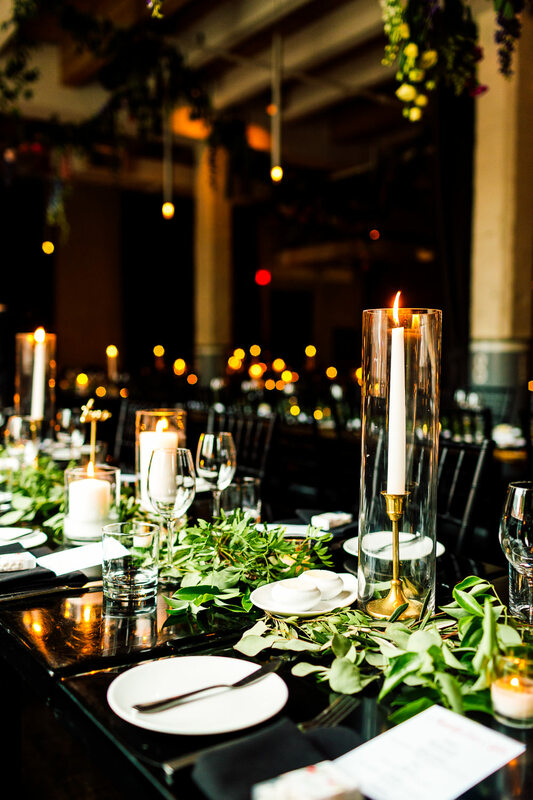 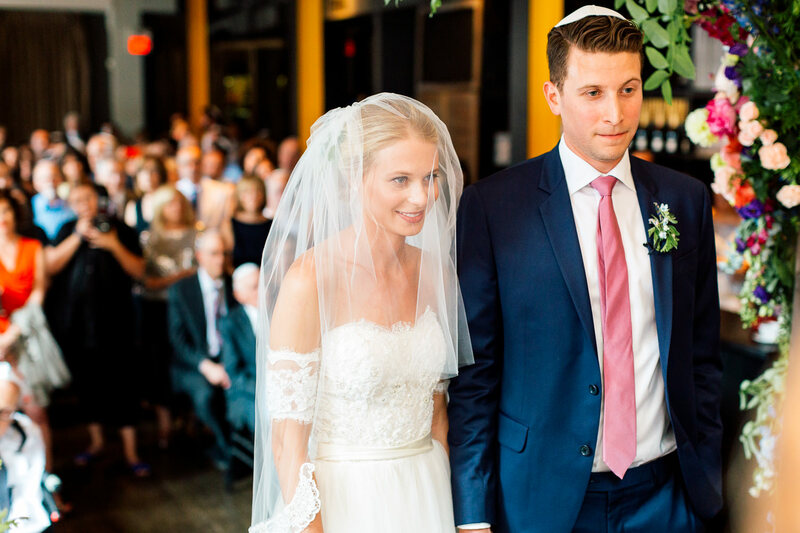 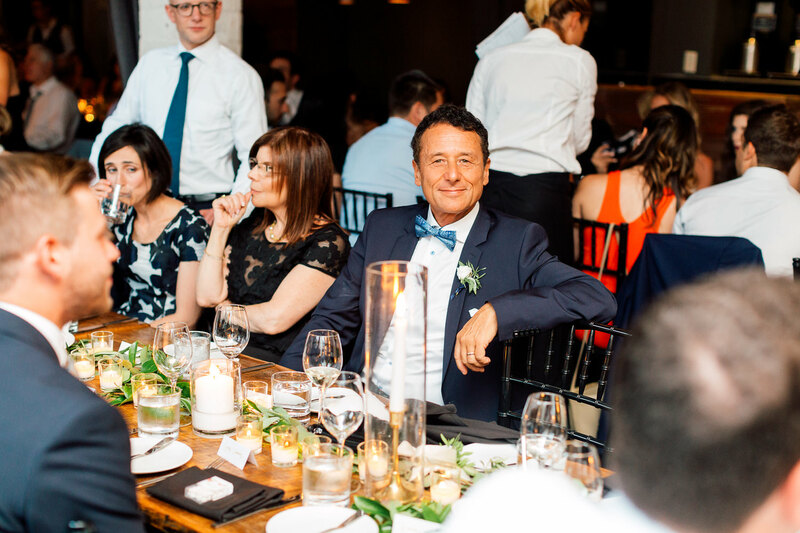 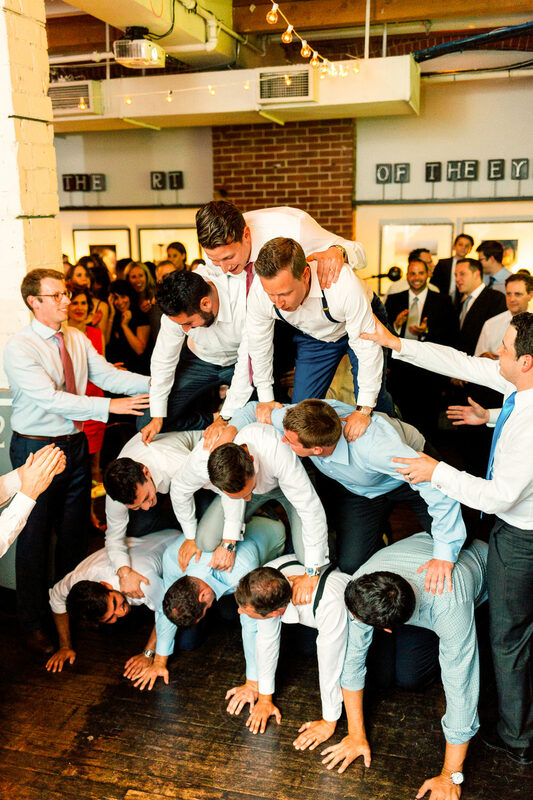 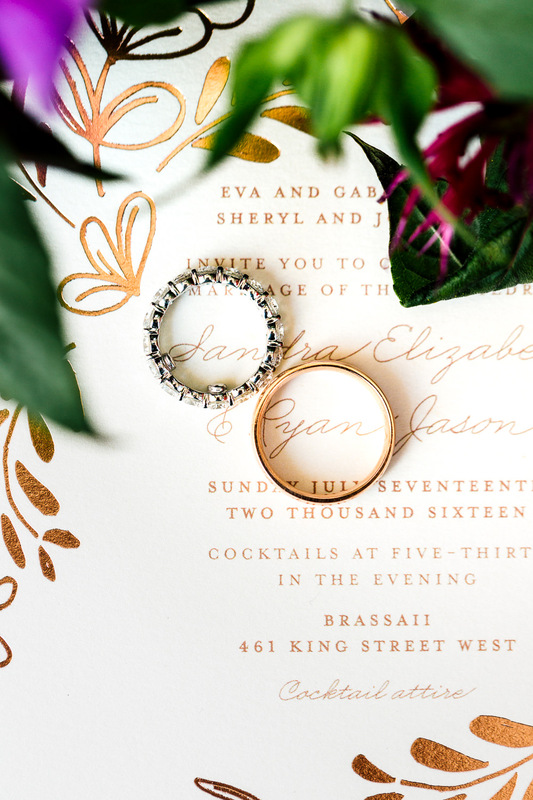 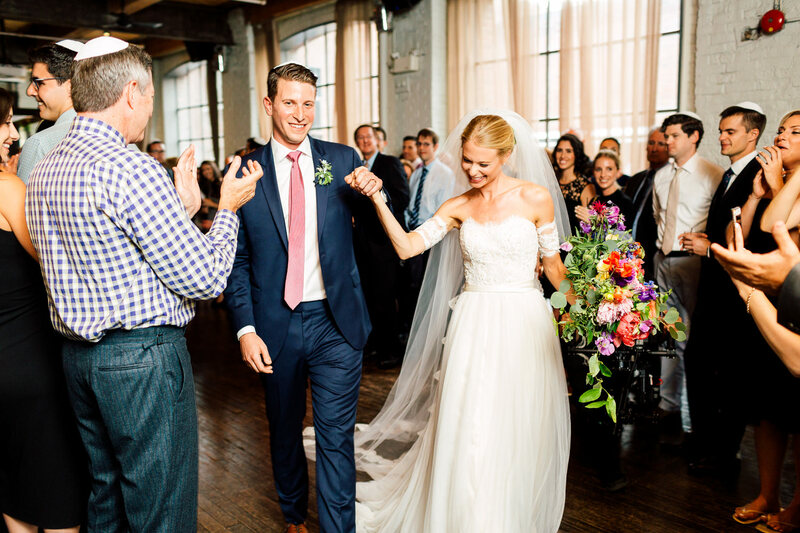 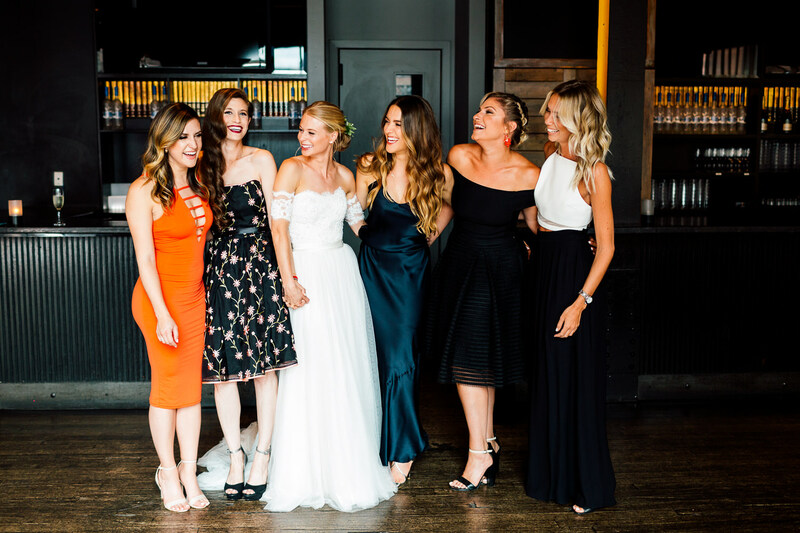 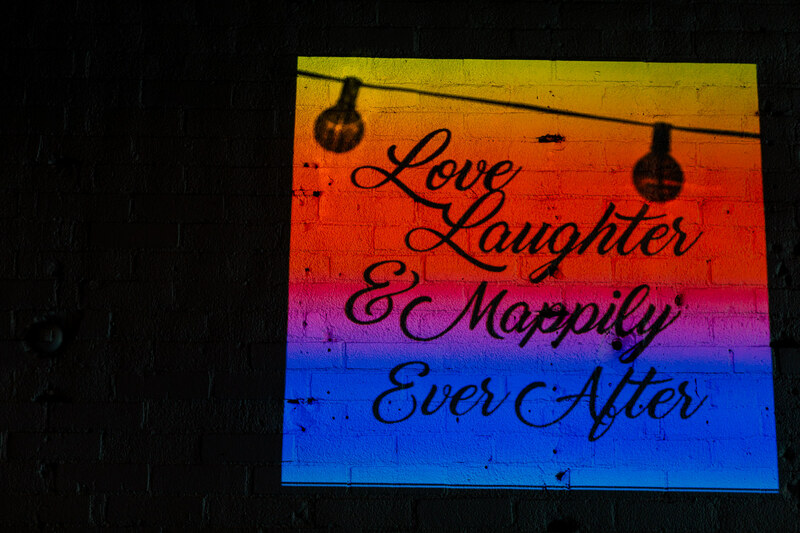 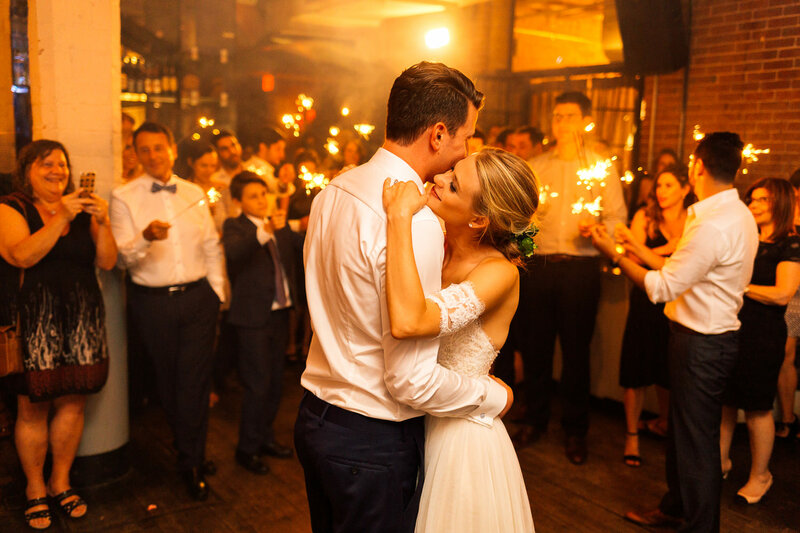 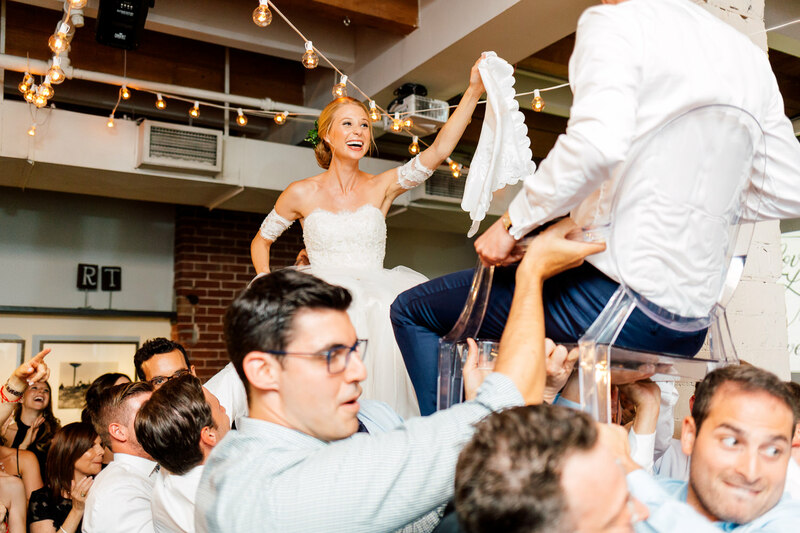 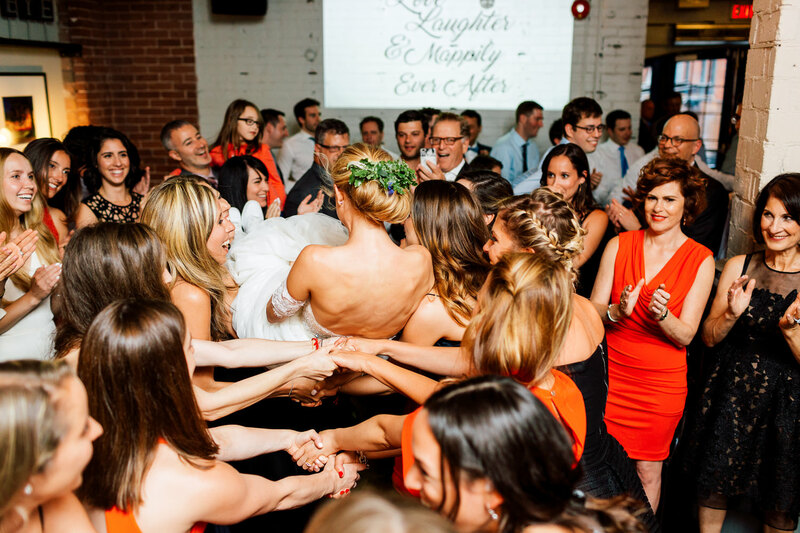 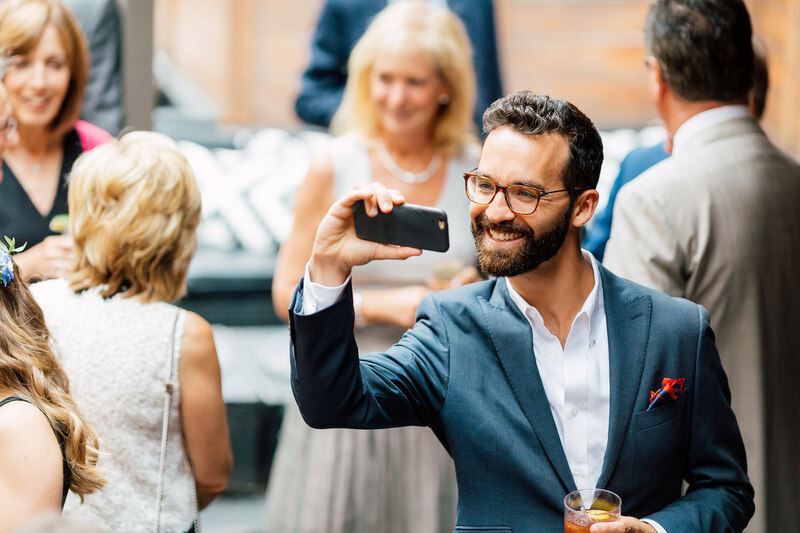 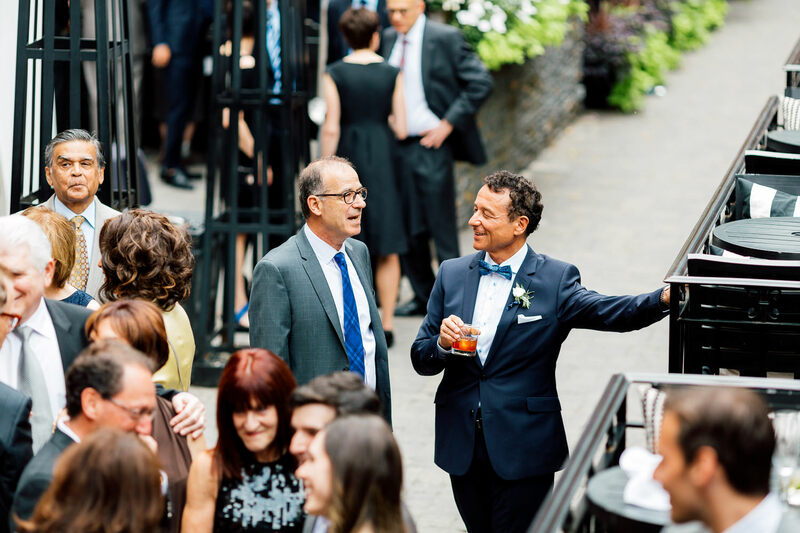 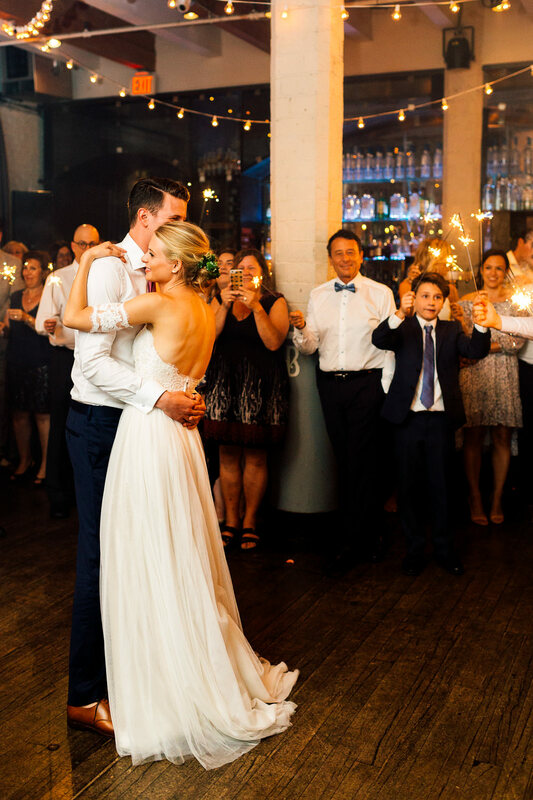 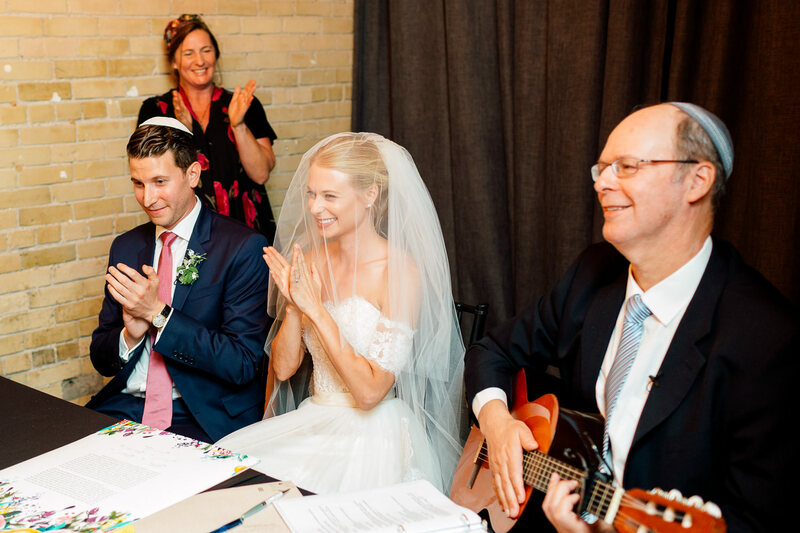 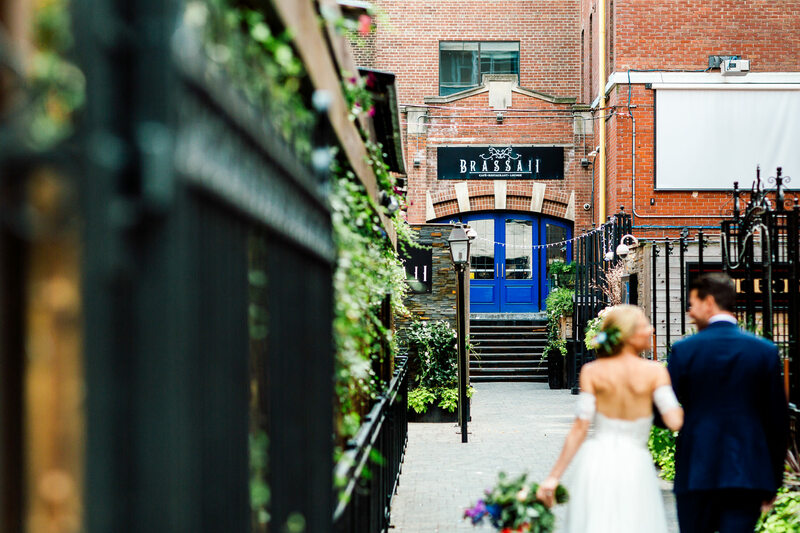 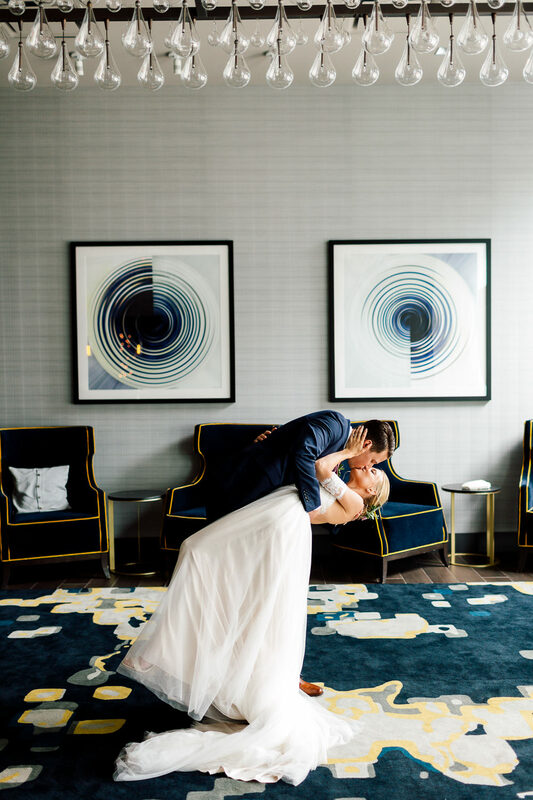 Instead of the usual events venue, the couple wanted to have their ceremony and reception at Brassaii – a loftlike restaurant and lounge in the heart of downtown Toronto. 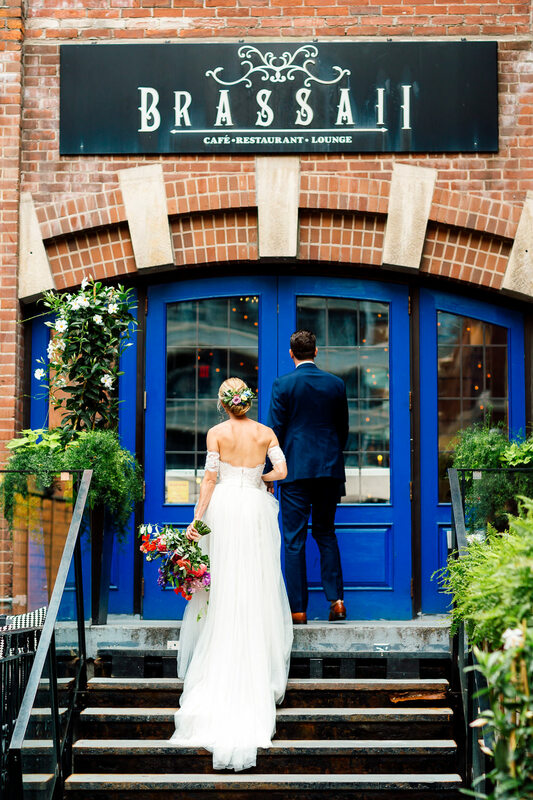 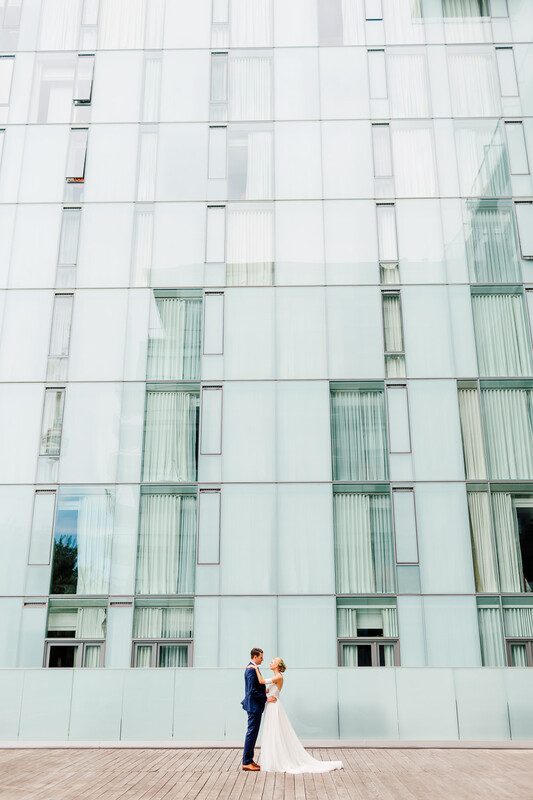 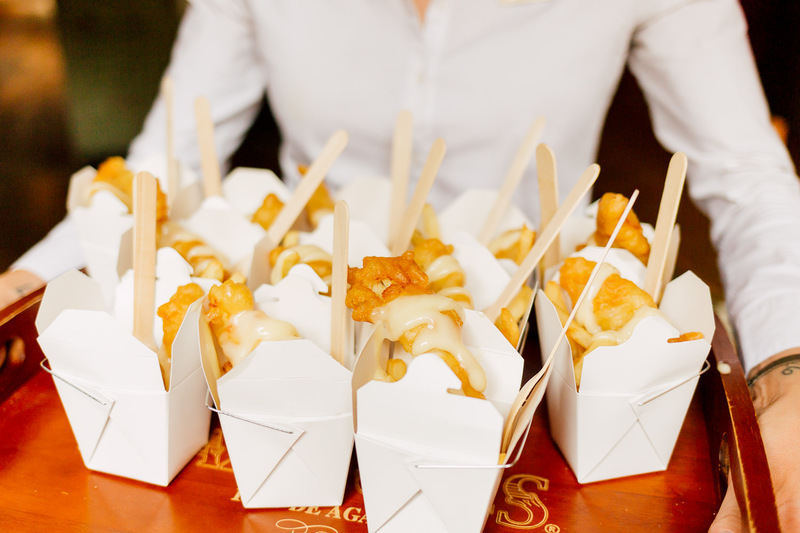 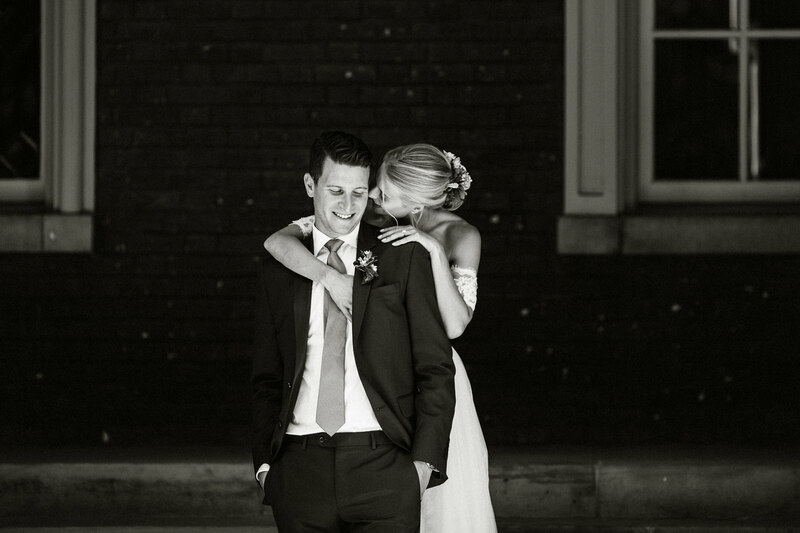 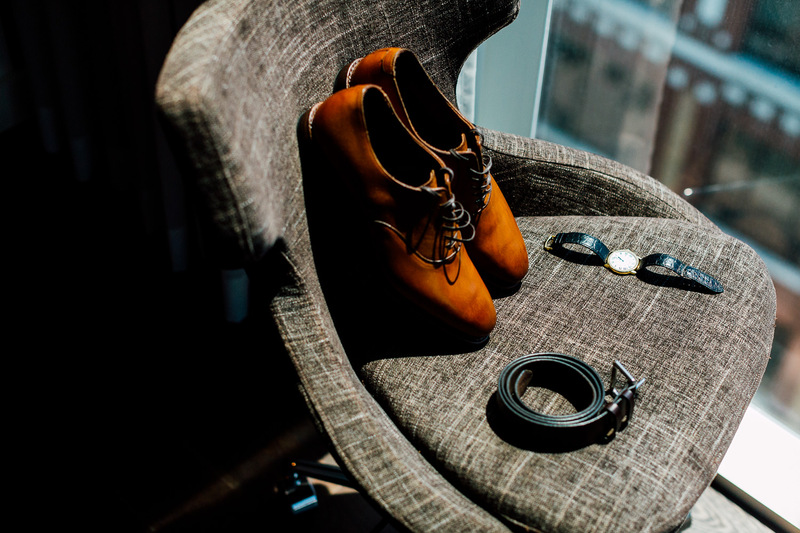 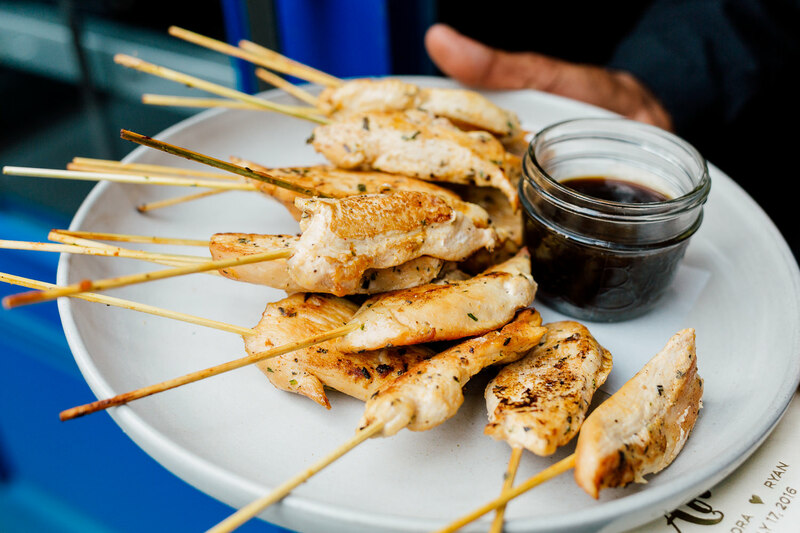 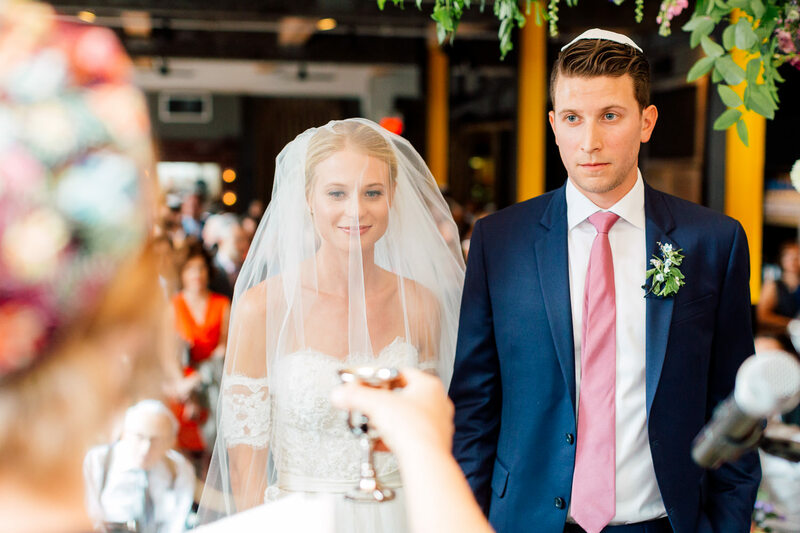 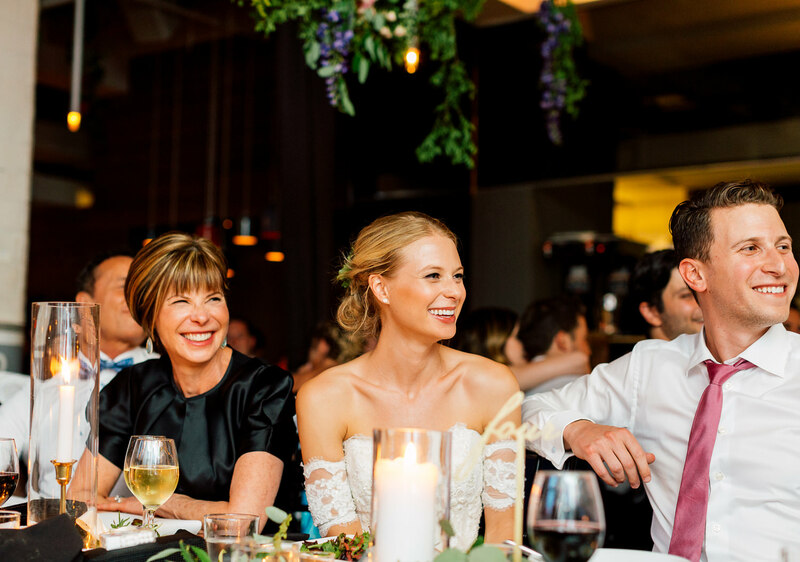 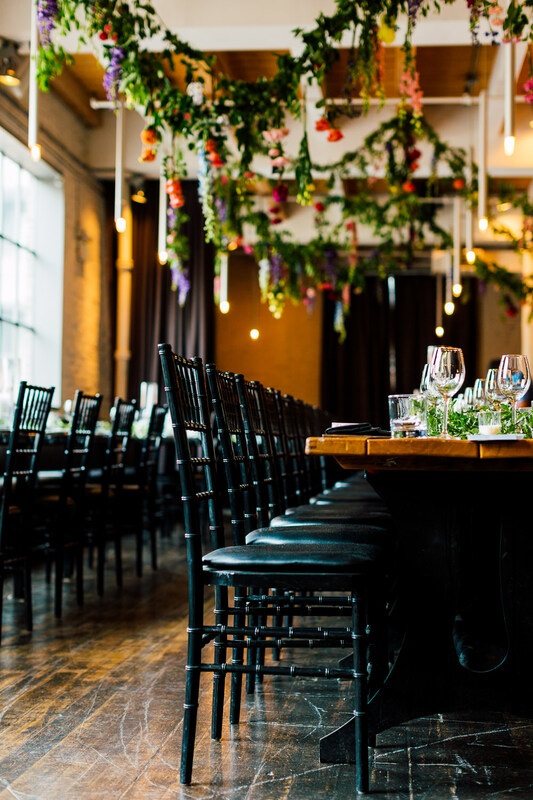 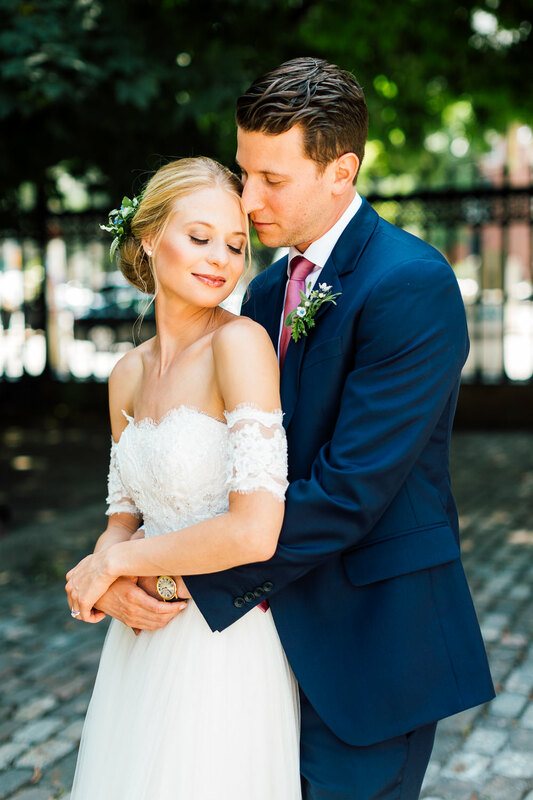 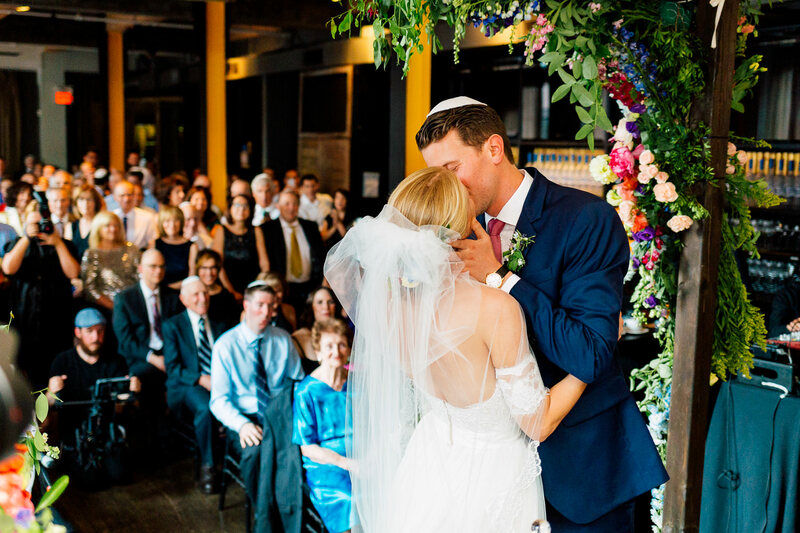 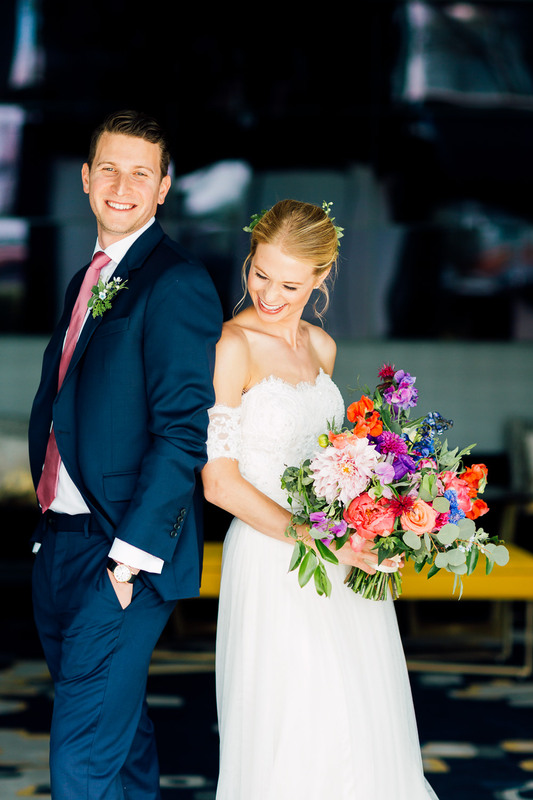 The restaurant’s charming urban atmosphere definitely fitted the style of Sandra and Ryan’s modern and stylish wedding. 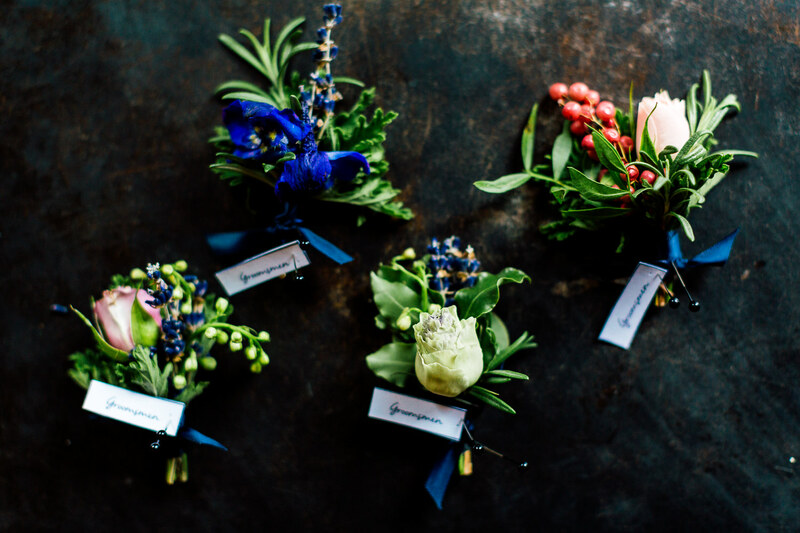 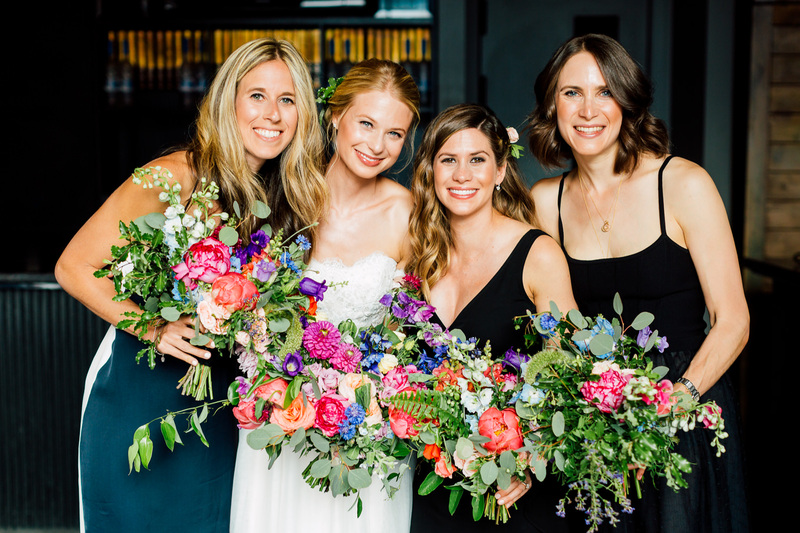 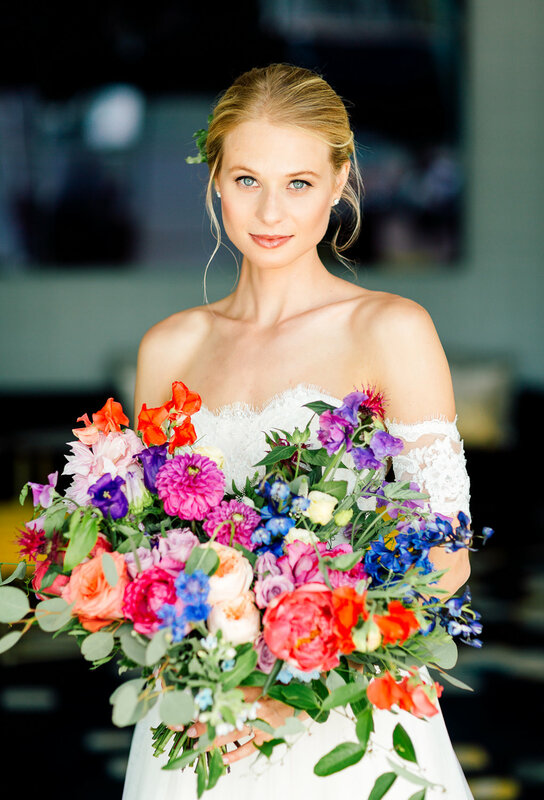 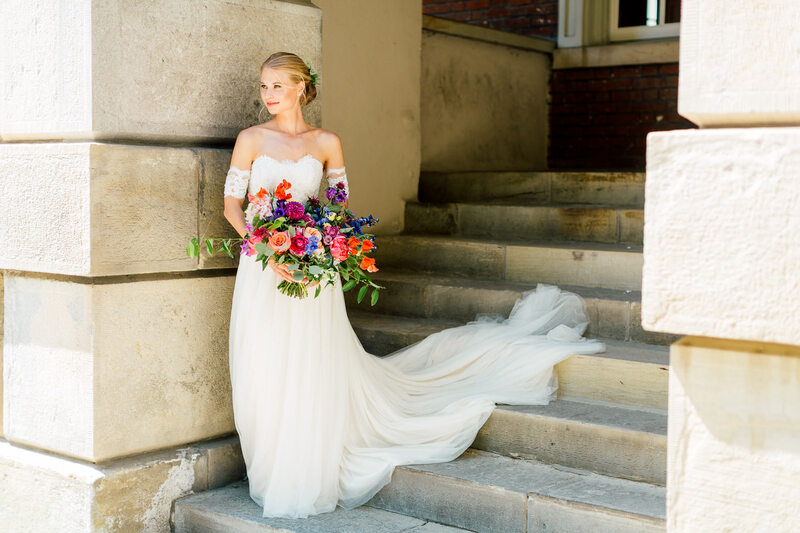 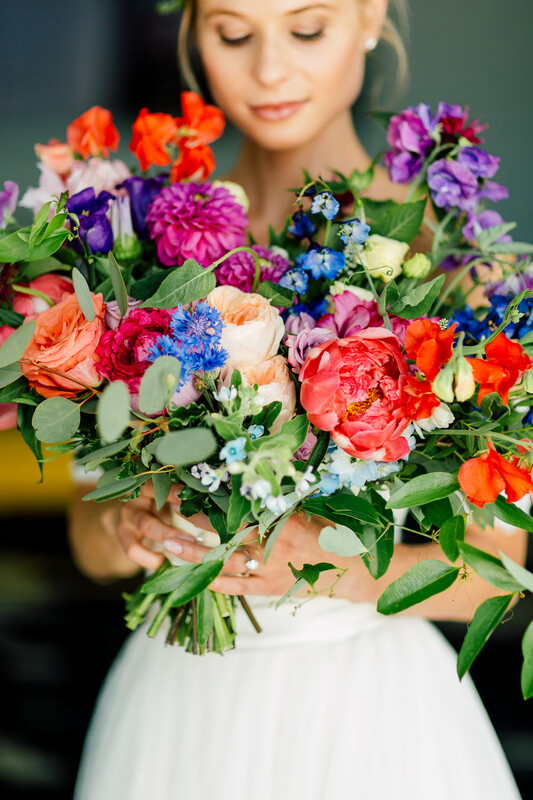 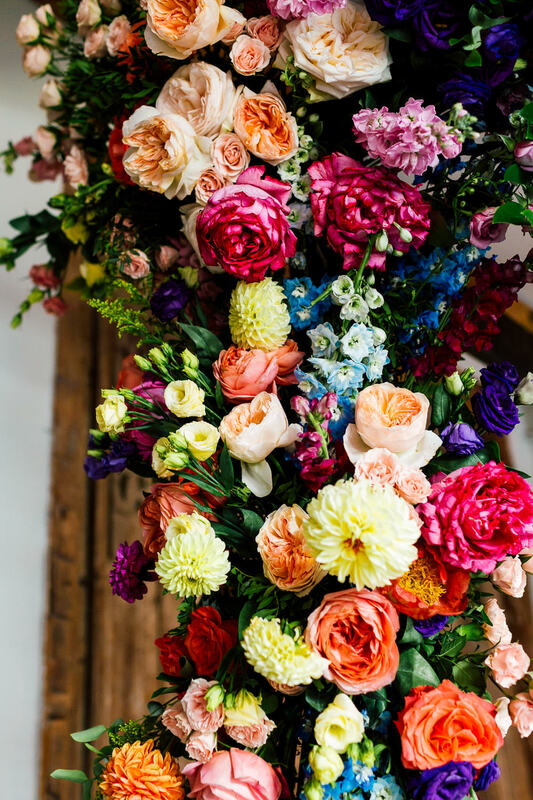 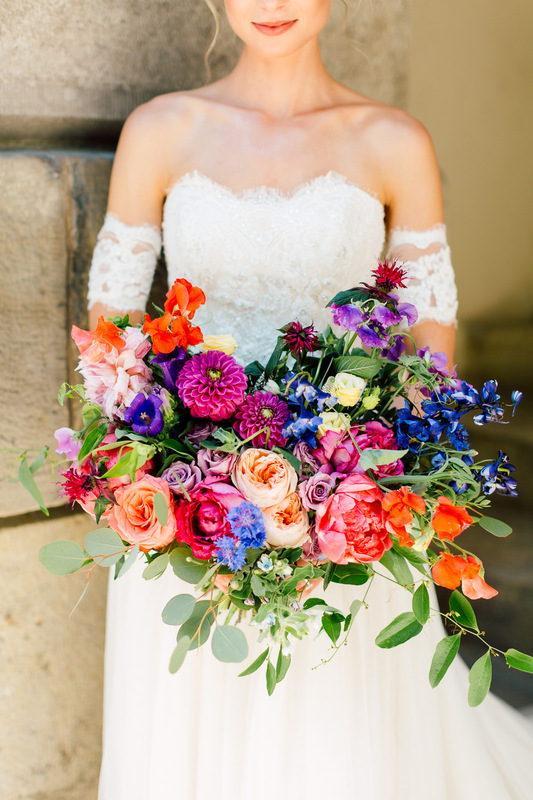 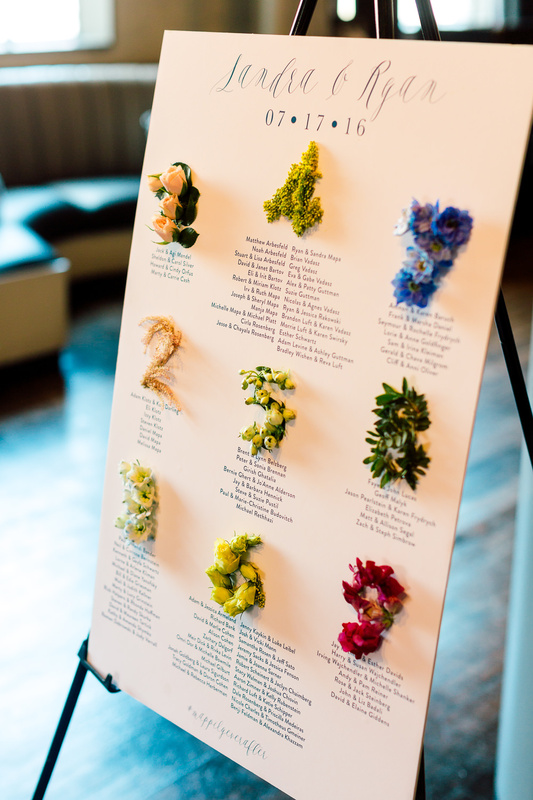 We can’t ignore the grand bouquets, and floral arrangements by Blush & Bloom. 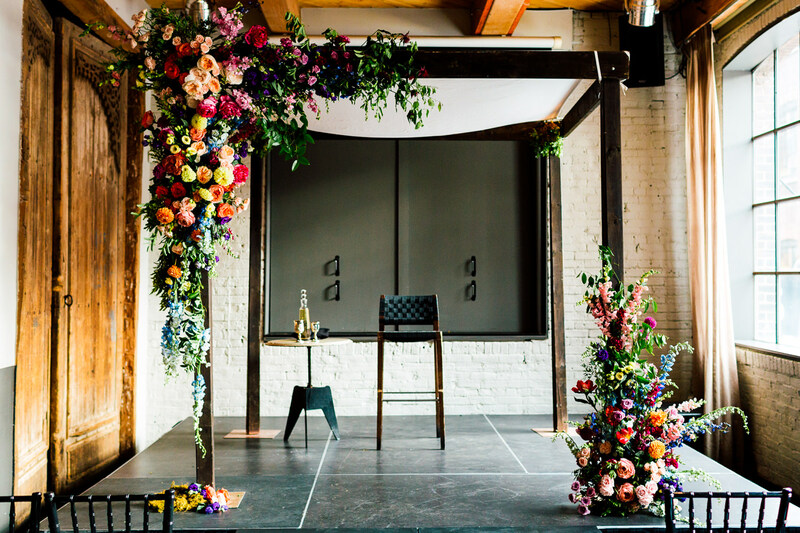 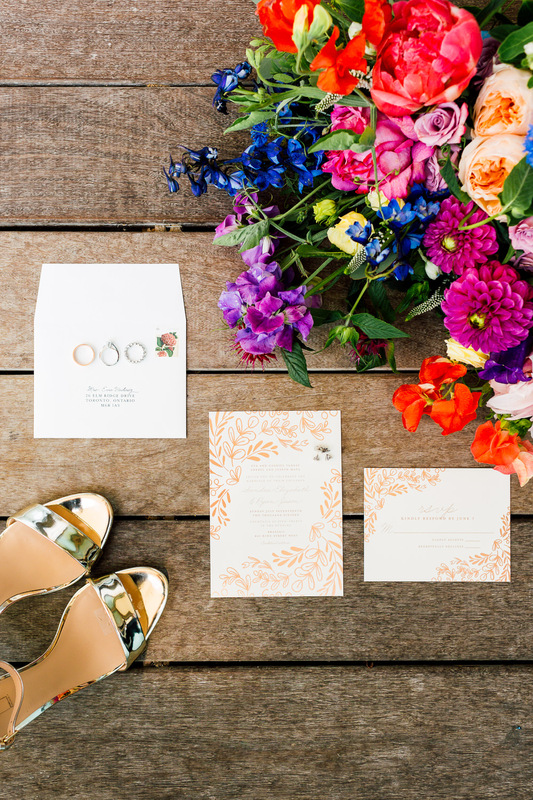 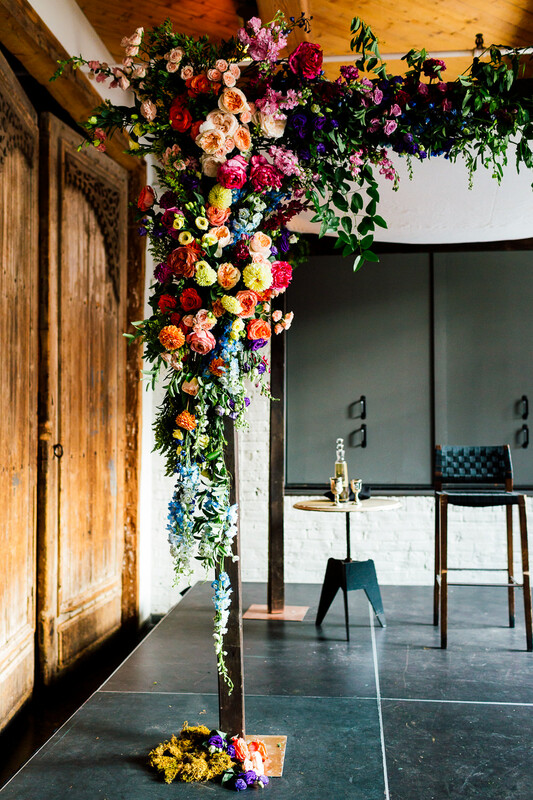 The collection of different flowers and colours added a little more boldness to the bride’s look, and brought the venue to life. 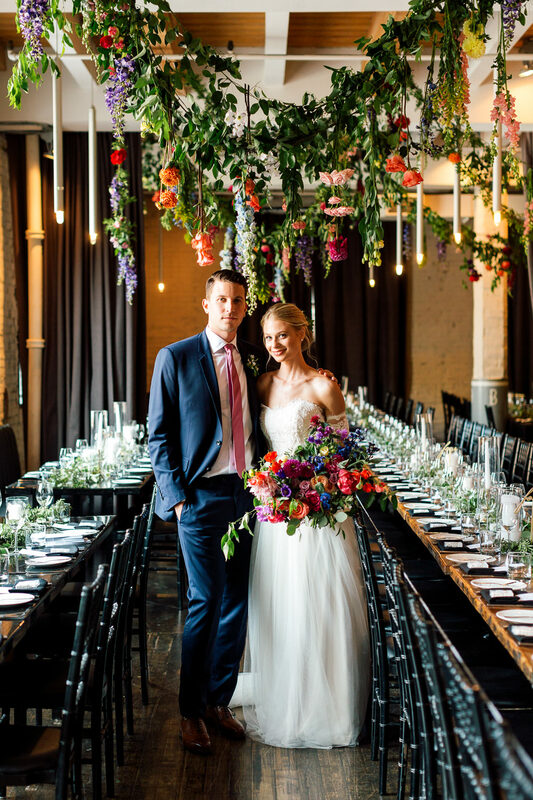 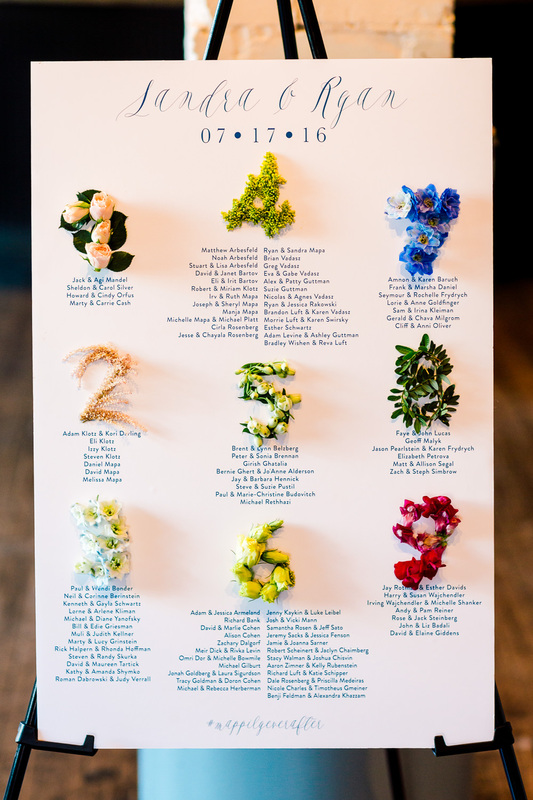 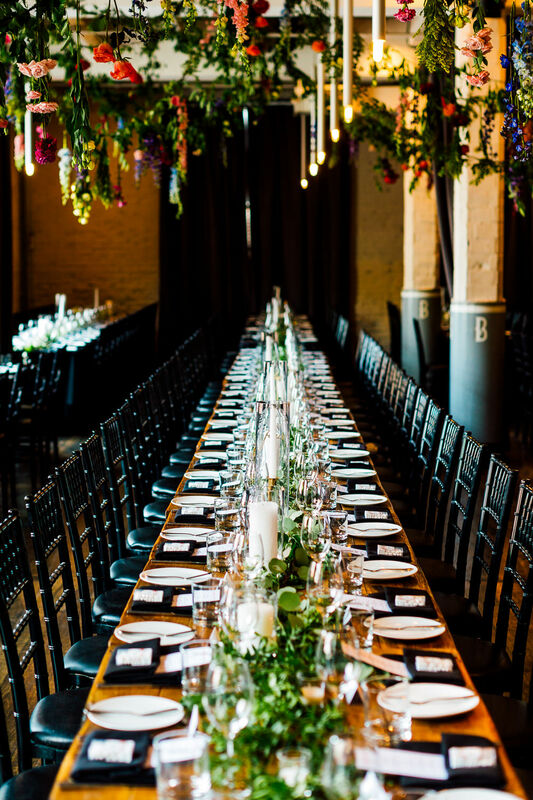 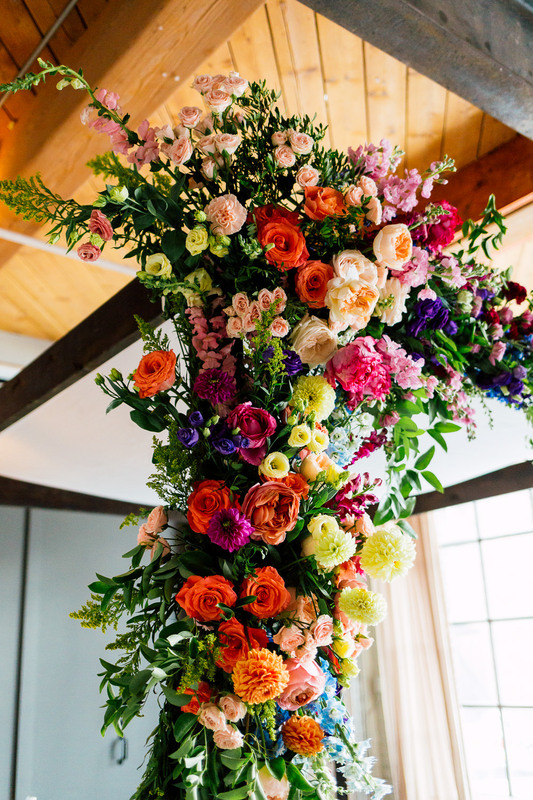 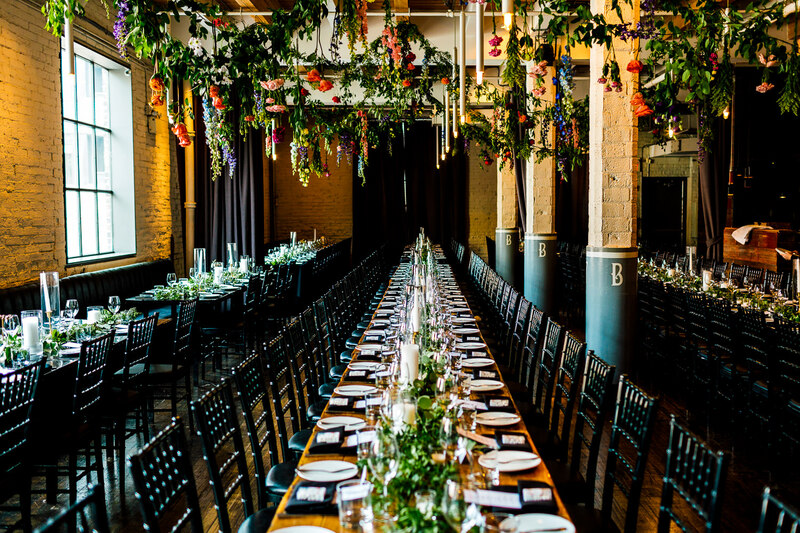 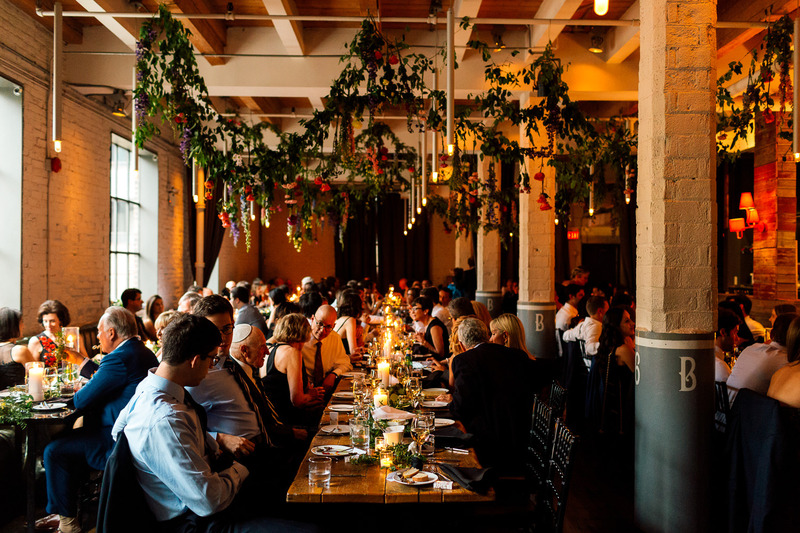 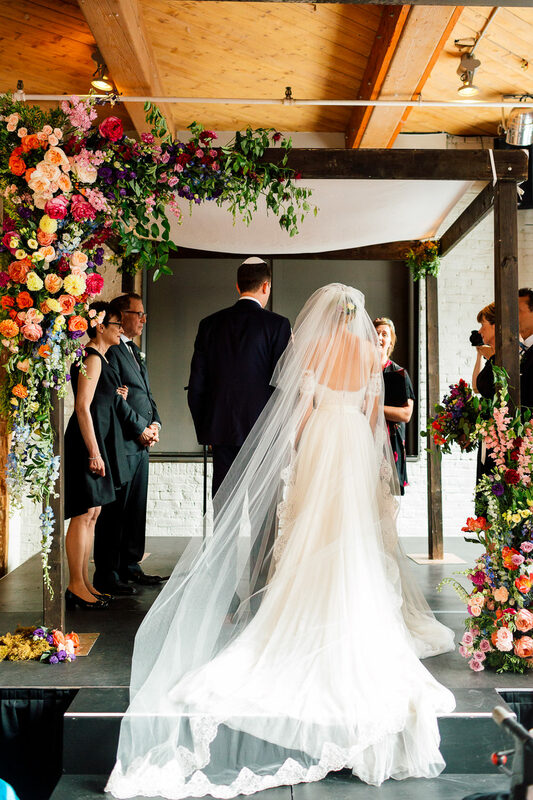 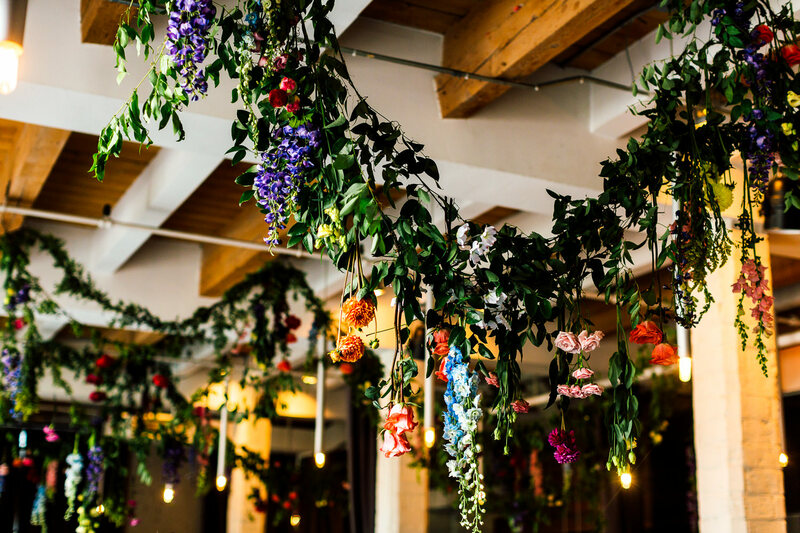 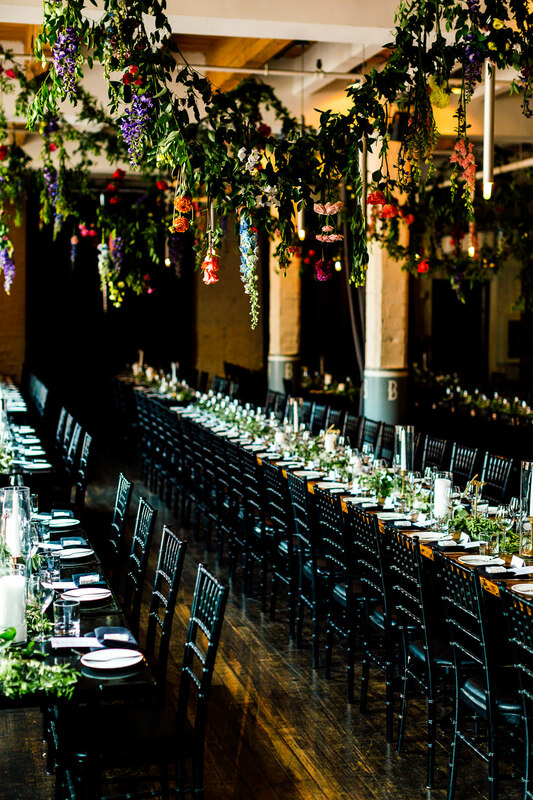 Instead of going crazy with the tablescape, the flowers hung like streamers across the room transforming it into a magical garden. 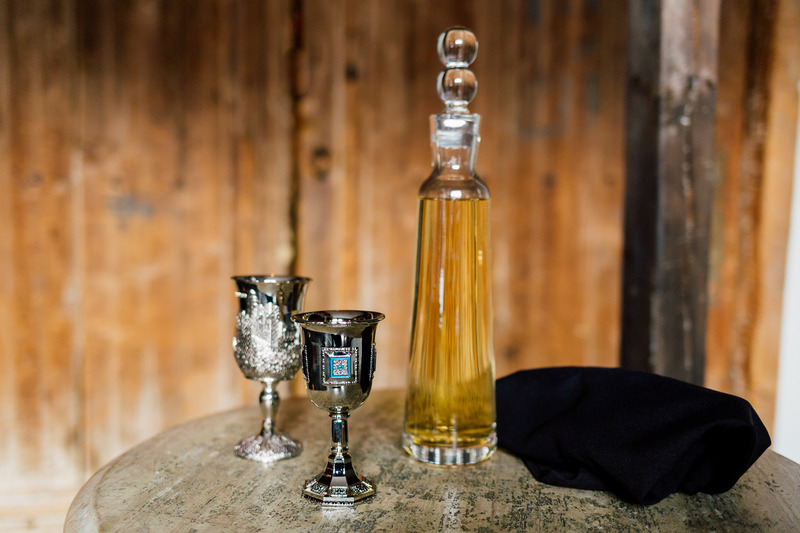 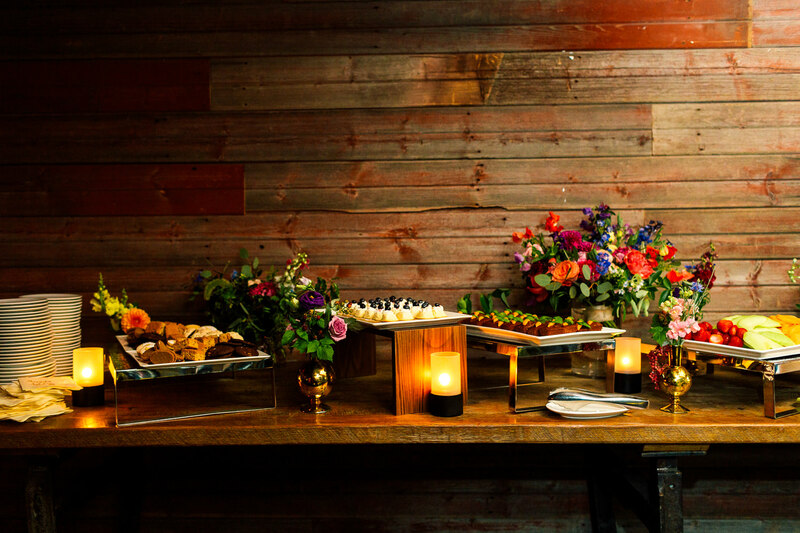 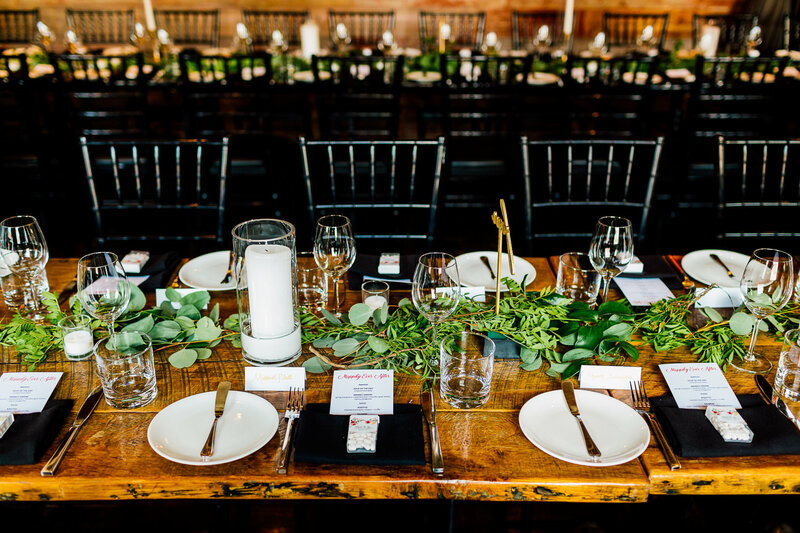 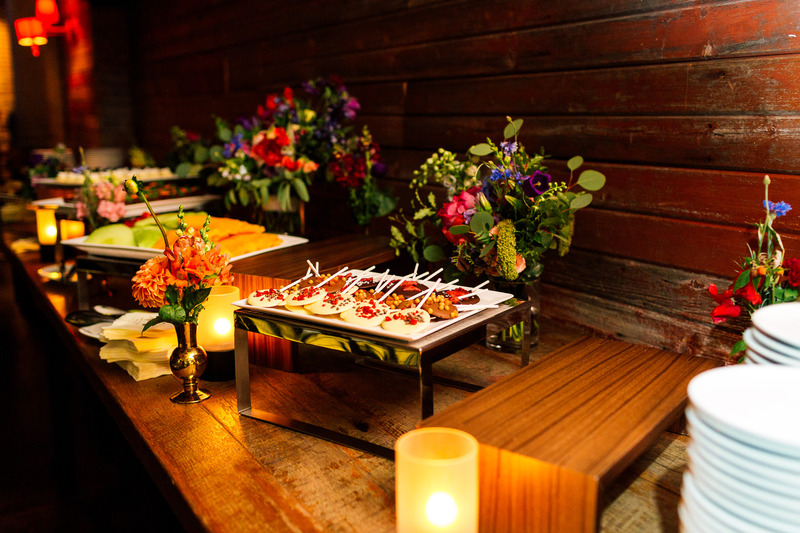 We always love long table settings – it makes the whole celebration feel more communal and intimate. 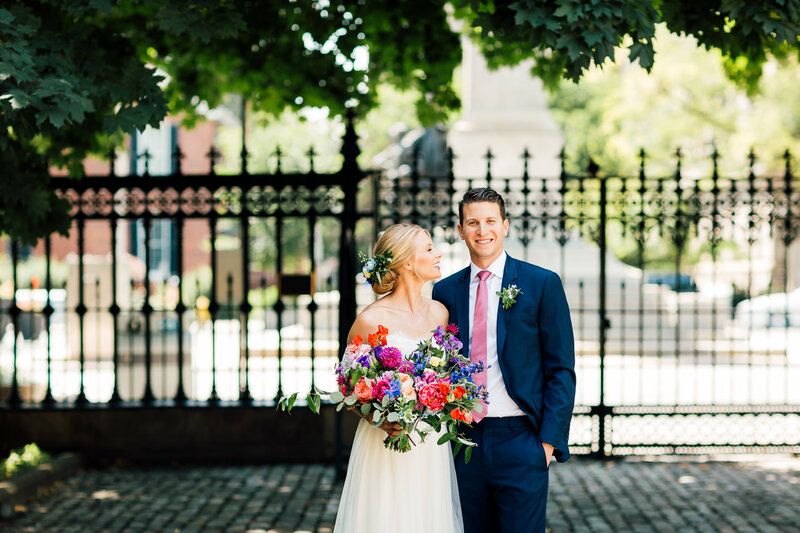 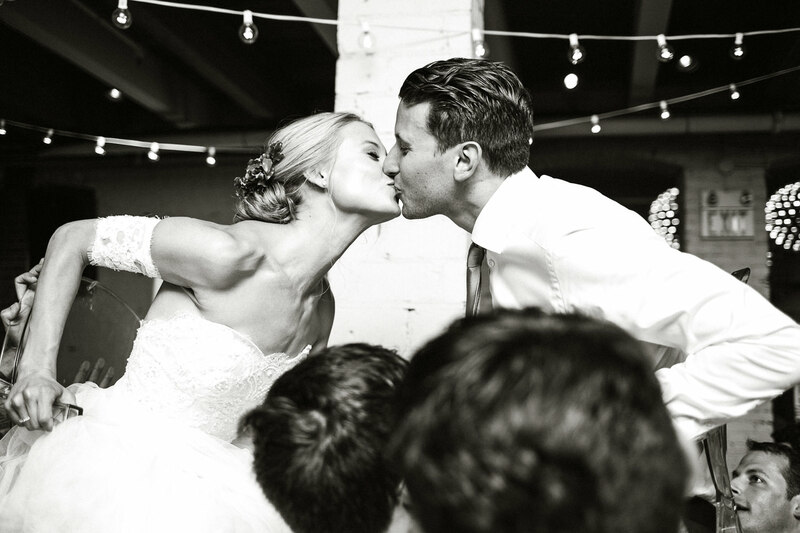 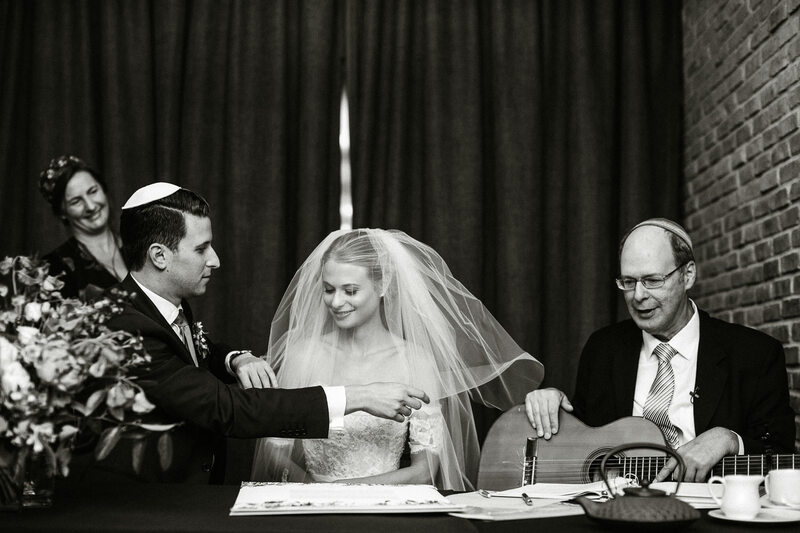 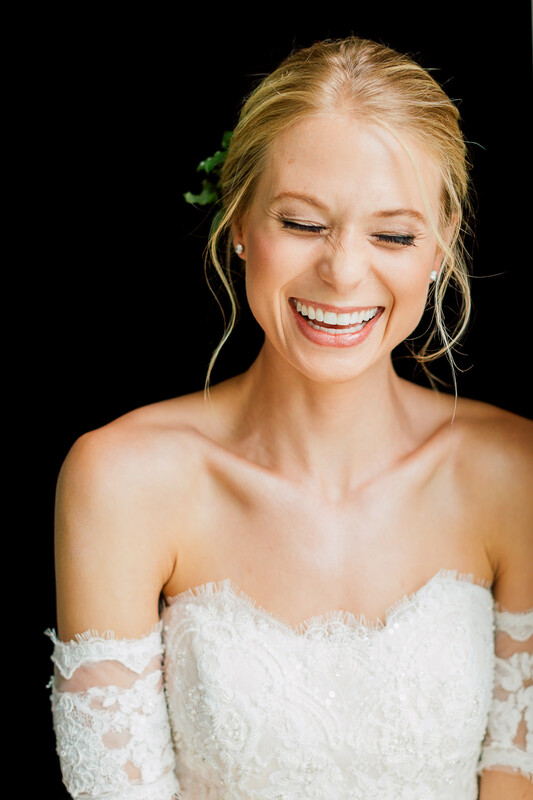 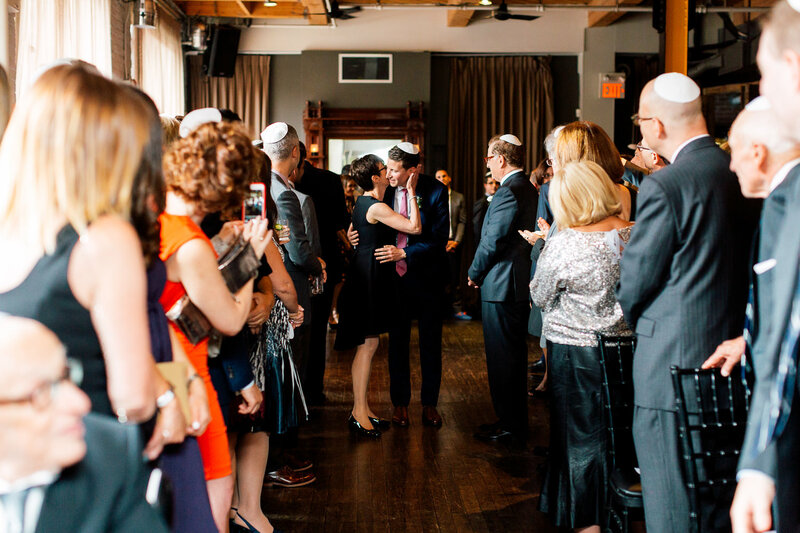 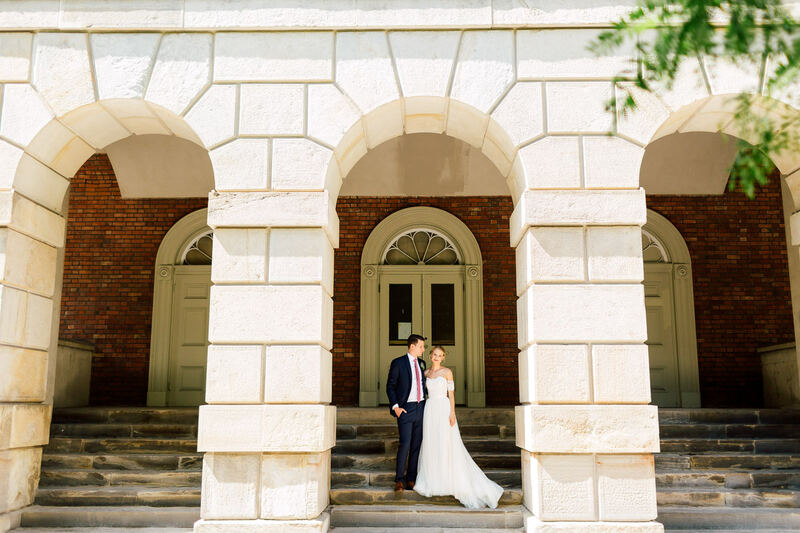 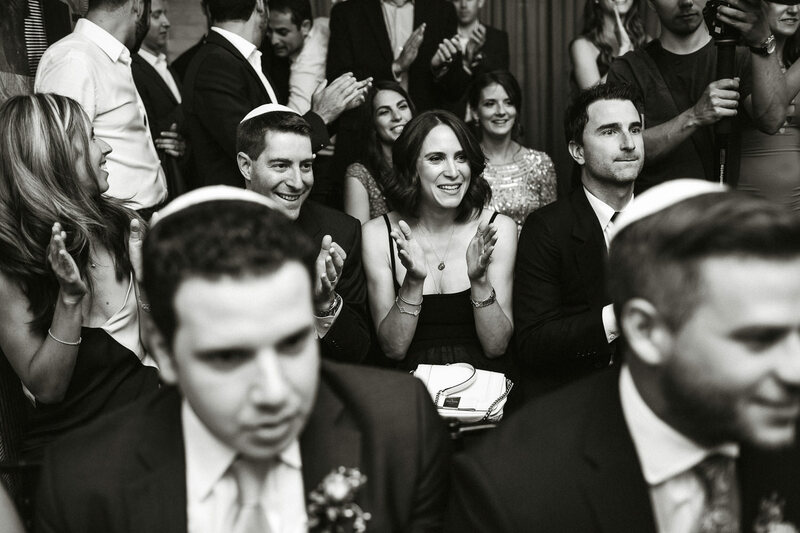 Sandra and Ryan kept it simple and light-hearted. 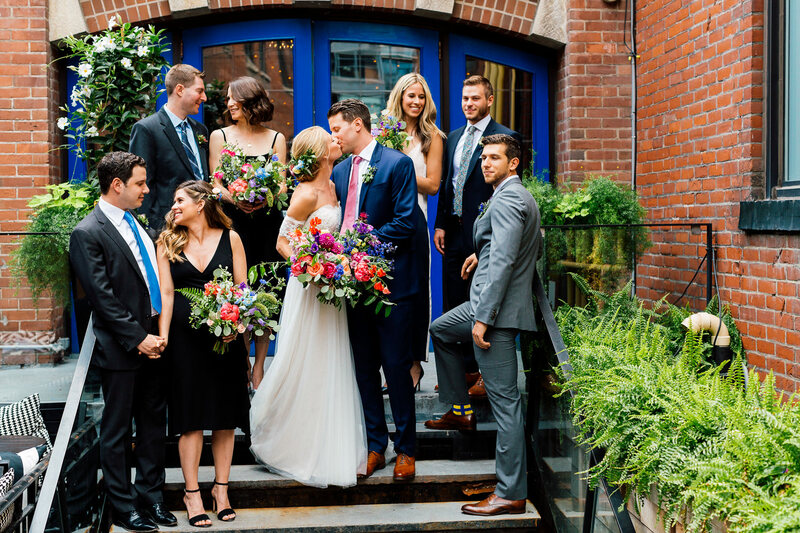 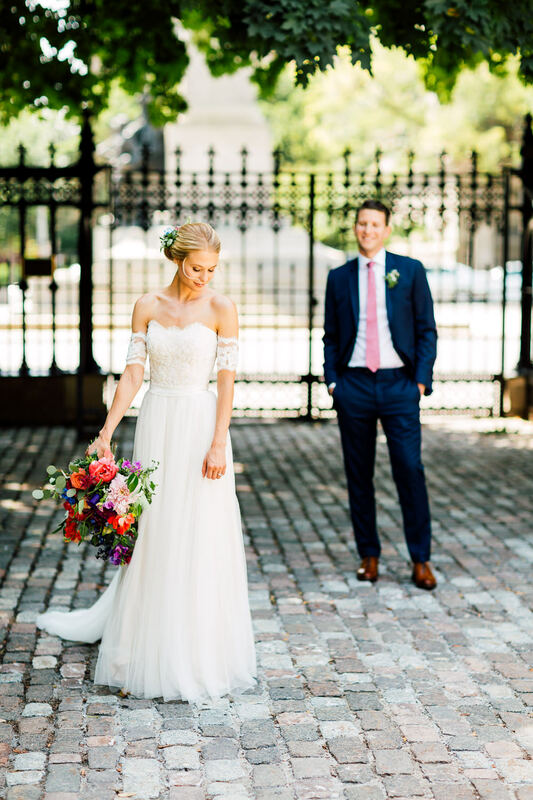 With no bridal party, they got to spend a romantic afternoon together before tying the knot. 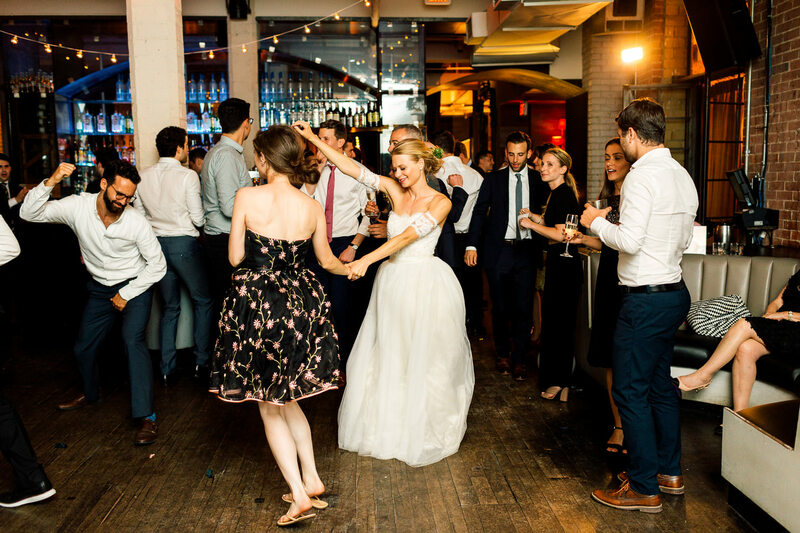 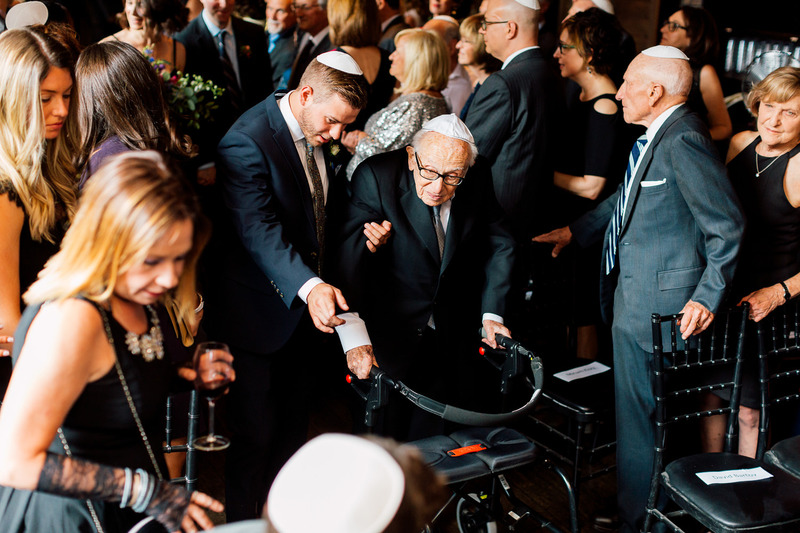 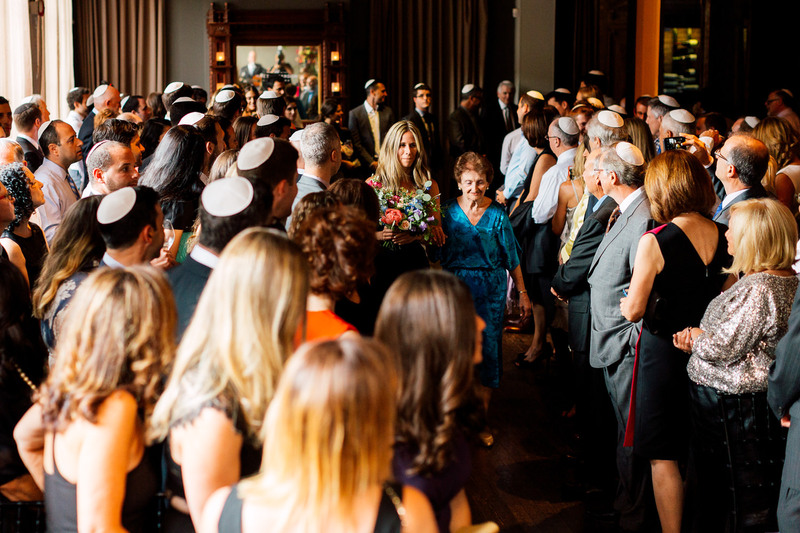 Their guests were as easy going as they were, making jokes and pulling crazy dance moves. 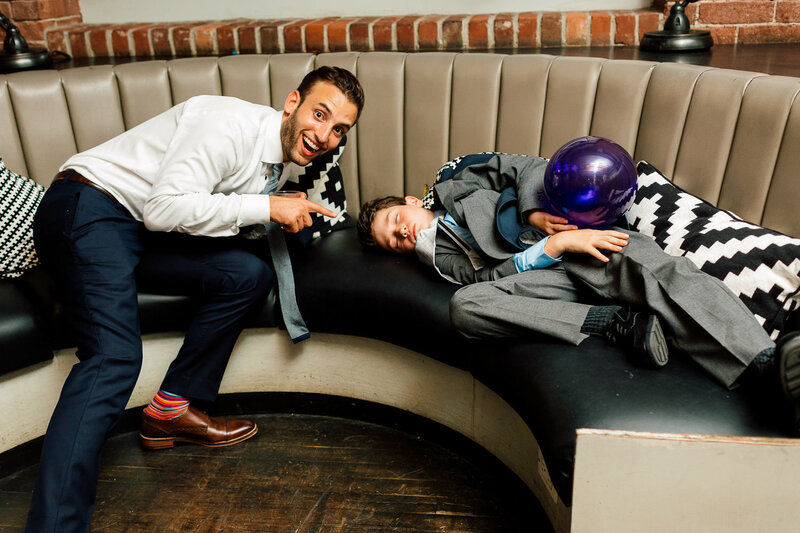 They kept us up in our toes, never a moment too dull to capture. 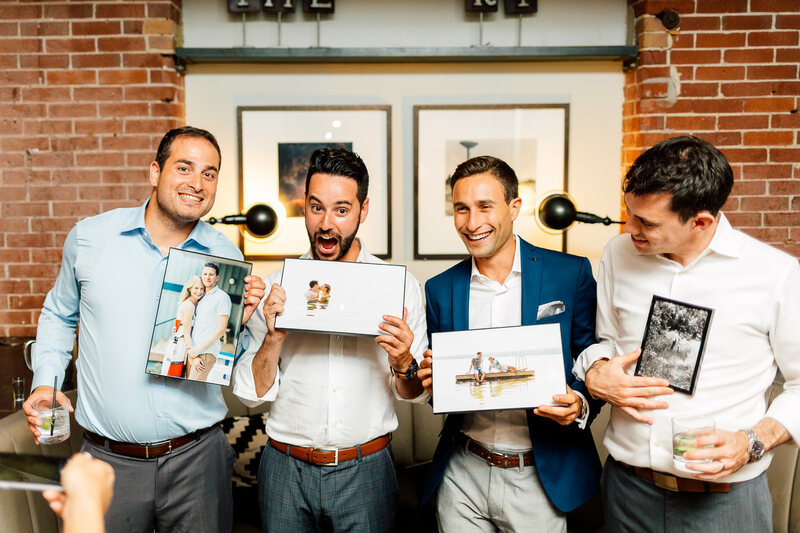 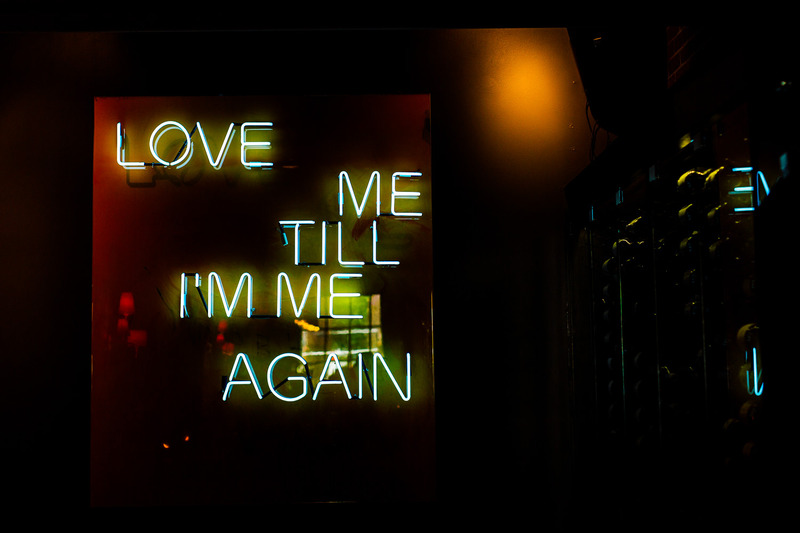 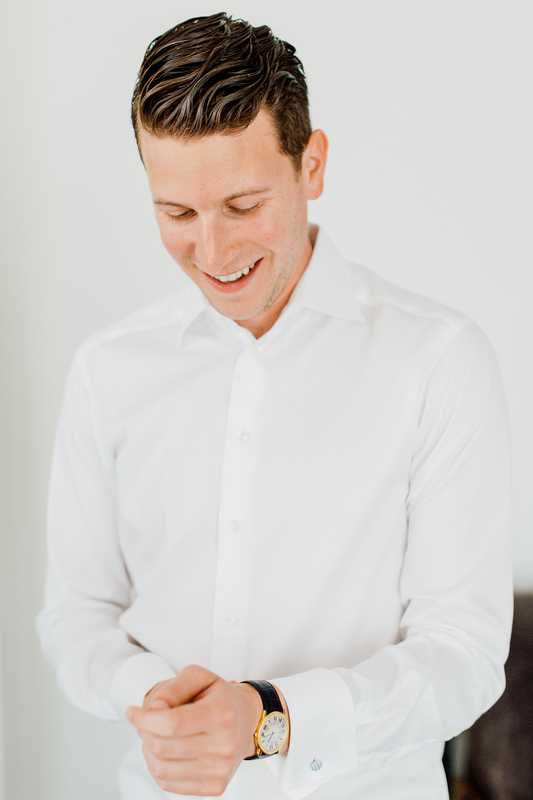 It was so difficult selecting the photos to present in this post because so many brought us joy, and we hope you find yourself smiling too!